One thing I have mused about is the fact that science isn’t owned by scientists. When I was young I painted houses with a boss three times my age who, in the winter, hunted wildcat for their fur, and who to this day, forty years after his death, still holds the record for the largest wildcat bagged in New Hampshire. (91 pounds.) I doubt there is a biologist alive who knows half of what he knew about wildcats, though he was unschooled and didn’t live to see a computer. All he did was observe, observe, observe. Yesterday I was chatting at a wedding with a man in his seventies who “only has a high school education,” yet is sought out by young men who hold graduate degrees at MIT and Harvard, because he spent his entire life in the world of surgical tubing. He got a job right out of high school at a place that made surgical tubing, and simply was curious about the subject, and never stopped learning. Now, though he is old enough to be fully retired, he still works, (though not in a nine-to-five manner.) He chuckles at the irony of being an “uneducated” man who is sought out by the “educated,” when there are problems to solve. I don’t think his value involves technical details as much as it involves his attitude. After all, the technical details evolve with such speed these days that the computer I now work on is out-dated and “archaic,” though not all that old. There is something about problem-solving that is timeless, and beyond being up-to-date about the latest gizmo. I like to muse about things that are timeless, and my musing wonders if part of learning simply involves observing, and noting what you didn’t expect, and, rather than feeling threatened about being “wrong,” cultivating a sense of wonder. It certainly is more fun to wonder about things, rather than cringing in shame over being mistaken. Rather than feeling chagrin, you feel wonderful, as you are full of wonder. That in turn is more conducive to finding an answer. In any case, the whole political world of Global Warming, the “Death Spiral” of arctic sea-ice, and the spectacle of egotistical, grant-hungry scientists insisting “the science is settled”, seems a bit of a farce to me. I want nothing to do with it, and again and again have tried to slip out the back door and avoid it, but it keeps hounding me. I think one is suppose to state a conclusion about the sea-ice minimum because we are midst a political battle, called “The Climate Wars,” but part of that battle is against insane pseudoscience, wherein one is suppose to pretend they have authority no mortal man has. As a way of fighting that stupidity it seems wise to simply refuse to draw any conclusions or theories, and instead to wonder about what I didn’t see coming, about my predictions that failed, and about things that surprised me. I think the biggest surprise over the past year was to have both the PDO and the AMO flip. The PDO, which is in a long-term “cold” phase, spiked in a “warm” way, while the AMO, which was in a long-term “warm” phase, spiked in a “cold” way. The current antics of the PDO and AMO are not something that has never been seen before, in a general sense. The north Pacific was roughly as warm (though we lack precise data) back in 1918; the PDO had a “warm” spike during a “cold” phase at the end of the 1970’s; and the AMO record is full of brief spikes the “wrong” way, each with a complimentary growth or shrinkage of sea-ice, in the limited records we have (due to the hard work of Scandinavians, especially the Danes), going back to the late 1800’s. One thing is in fact unprecedented, and that is the detail we are now able to watch the sea-ice with, due to buoys and satellites. We are witnessing things for the first time. Because the satellites first started allowing us to see right when the AMO was switching to its “warm” cycle, we have largely been watching the extent of ice shrink as the years pass. This led some to conclude too quickly that we were in a “Death Spiral.” Now we are watching the AMO near the end of its “warm” phase and start to turn towards its “cold” phase. We actually have little idea what we will see, because we simply have never seen it before. It is fun to guess what will happen, but to express certainty seems to me to be sheer folly. Therefore it seems wiser to simply state what I didn’t expect. I definitely didn’t expect there to be more ice around Svalbard last summer than there was last winter. That was a real eye-opener, and seems likely to be a response to the AMO briefly spiking “cold” during the first half of the summer. 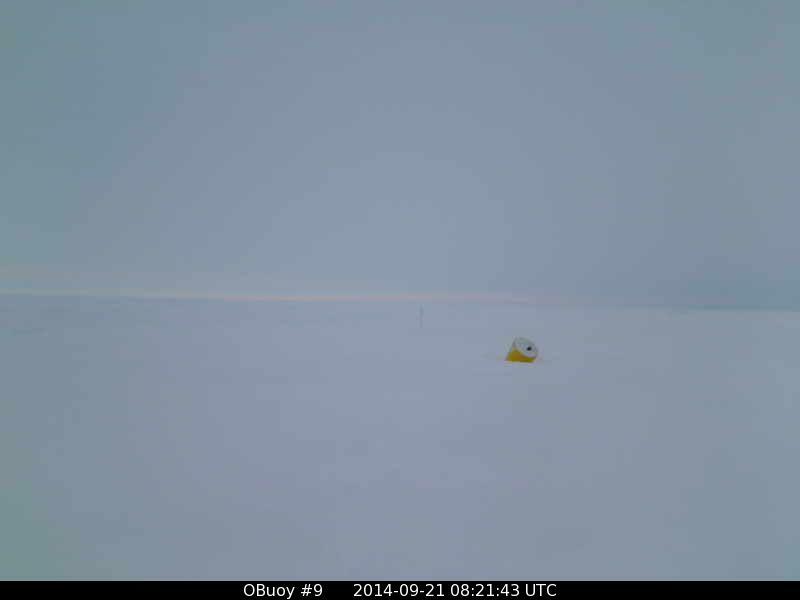 I didn’t expect there to be a notch of open water extending towards the Pole from the Laptev Sea. Wondering about this led to a delightful mental journey to Siberia, and study of the the Laptev Sea, and the Lena River basin. Seeing what I didn’t expect doesn’t cause me to sulk. Perhaps this is because I am not dependent on grants, and only watch ice melt for the sheer wonder of it all. In fact, seeing what I didn’t expect gives me all the more reason to sit back and wonder all the more. That is actually my pay. Where a Climate Scientist might be in danger of losing funding for cameras, buoys and satellites (and vacations) if they expect a Death Spiral and the unexpected occurs, the only danger I face is if I wonder too much, and forget to mow the lawn. This post will simply be a presentation of the Danish Meteorological Institutes arctic maps, with the most recent at the the top. I find that simply by scanning the maps one is able to create a sort of mental animation of what is occurring at the Pole, in terms of temperatures and weather. During the winter one is wise to keep an eye cocked to the north, and to be aware when the arctic is discharging in your direction. As a very general rule, when the Pole is importing air to your north you are more liable to get a thaw, and when it is exporting air to your north you are more liable to get a freeze. There are of course subtleties that make that rule look foolish. Part of the fun is noting what can divert the cold air, or retard it. However one thing I have noted is that as soon as the air starts to bulge south to your north, when the actual arctic air is still thousands of miles away, there can be a change in your local weather. I haven’t a clue why it happens; perhaps it is like the skin on one side of a balloon expanding when you compress the opposite side. The corriallis forse can curve the cold air from a north-to-south vector to an east-west-vector, or a lifting gale can sweep an entire air mass that was headed your way to the east. Also lighter winds can have the air-mass slow and pause and build over the snow covered tundra, with the chill at its center increasingly cold and ominous, before it charges down to get you, or is inhaled back north by the Pole. Until they freeze over, any body of open water will have a warming effect on an air mass, but as the winter passes and lakes and Bays and seas freeze over the north is increasingly able to generate cold, (or to lose heat.) This ability tends to peak in early February, but still occurs after the sun first peeks over the polar horizon in late March. Temperatures well below the freezing point of salt water persist through April, and the actual thaw never begins before late May. I like the DMI maps because they are simple, but it is important to remember winds do not always obey isobars. Once in a while it pays to check out more detailed arctic maps, especially in the case of an arctic snow. The best maps can be had for the price of a cup of coffee each day at the http://www.weatherbell.com/ “premium site.” Dr. Ryan Maue produces maps that show the runs of various modles in 3 hour increments, and if you look at the “initial” map you can get an idea of where the winds are strong and where they are aiming. Also, of you are in a hurry and don’t mind maps that often mislabel highs as lows and lows as highs, you can check out http://www.weather-forecast.com/maps/Arctic?over=pressure_arrows&symbols=none&type=wind. It is important to watch Siberia, as it creates the coldest air in the dead of winter. I get nervous when that air becomes a “cross-polar-flow” heading my way. Once again, the most recent maps will be on the top, and the oldest maps on the bottom. I have been lurking about the web, seeking to learn how in the world Alarmists can explain-away a million km2 increase in sea-ice around Antarctica. How can “Global Warming” cause so much more ice? As I understand it, their explanation involves imagining that Global Warming is melting Antarctic ice that is made of fresh water. Because there is so much melting going on down there the ocean is less salty. Because it is less salty, it freezes more readily. This idea may sound intelligent to the uninitiated, however to those who have bothered study sea-ice even a little, it is not a very thought-out idea. In fact I would call it pablum for blithering idiots, but that would be rude. Their illogical thought-process seems conclude that the increase in sea-ice must be due to warming, and in the desperate effort to create a scenario where warming creates ice they hit upon the idea that there must be more fresh water, (which freezes at a higher temperature), and that the fresh water must have come from melting. The problem is that the continent of Antarctica is too cold. Even in the warmest part of summer there is very little melting. 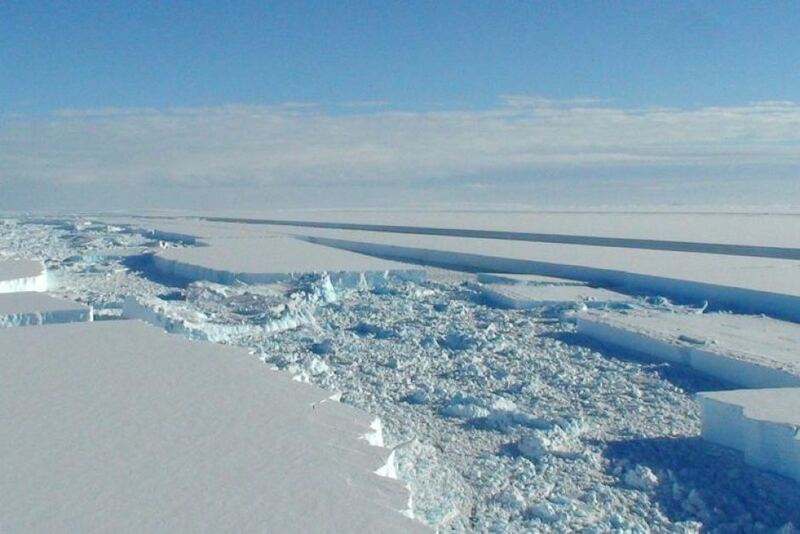 There are no rivers pouring off the edge of the ice into the sea. In terms of rivers, I only know of a single stream on a desert-dry, ice-free area of the continent, and I think it is less than ten miles long, and sinks into the sand without ever reaching the sea. And that is during the warmest time of year, while the ice we now see being formed has been formed during the coldest time of year. So the imagined increase in fresh water cannot be due to melting on the continent itself. They decided the fresh water must come from the sea-ice itself, and the melting was occurring on the underside of the ice, due to the up-welling of warmer water. This is unlikely, as temperatures are so low during their winter that the sea-ice is growing thicker, not thinner, but even if you humor them, their ideas fail. There actually are up-wellings of warmer water. As the wind comes screaming off the continent at extremely low temperatures it pushes both the ice and surface water away from shore, and because that water must be replaced, the replacement comes from deeper down, where the water is a little warmer. This water nearly instantly freezes, but the new ice is also pushed away from shore. (You need to understand the winds can be over 100 mph at times.) Amazingly there are areas of open water along the shores of Antarctica, called “polynyas”, even when temperatures are minus fifty and the wind-chill is ridiculous. The thing to remember is that this open water is not caused by warmth, but by cold. The colder the air gets, the more it sinks, and the more it sinks the faster the winds come screaming down from the highlands to the sea. The colder it gets the stronger the wind is, the more the ice is pushed away from land, and the more warm water up-wells. It may seem counter-intuitive, but if there was really warming occurring on Antarctica then there would be less open water. The winds would be less, less ice would be pushed off-shore, and there would be less up-welling of slightly warmer water. The polynyas would be smaller. However you must ignore that, to understand their excuse, which is that the slightly warmer up-welled water travels under the sea-ice, melting it as it goes, and then, at the outer edge, the fresher water emerges and, because it is fresher, freezes more readily, resulting in more sea-ice than usual. This idea has some serious problems. The main problem is that we are talking about sea-ice. 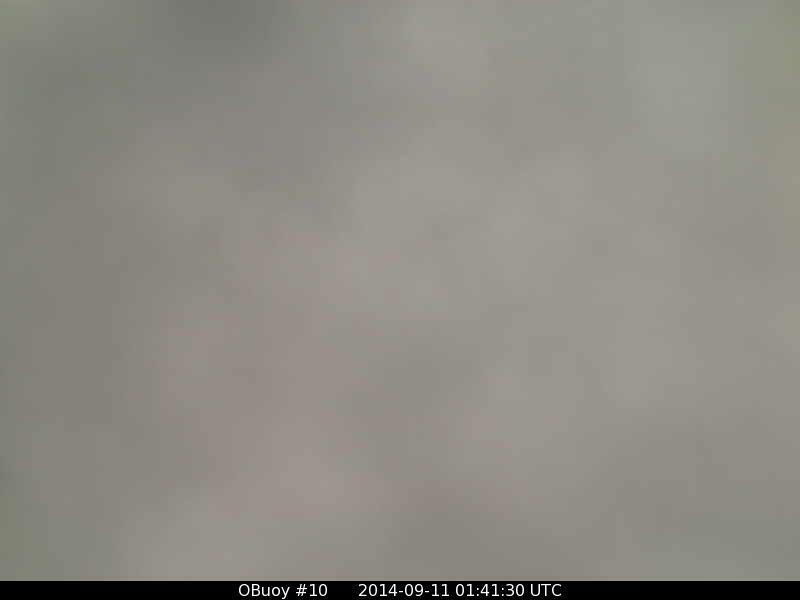 We are not talking about those amazing Antarctic ice-burgs that are hundred of feet thick. We are talking sea-ice, which must be grown from scratch, and which at first is only a few inches thick. Then it is a foot thick. 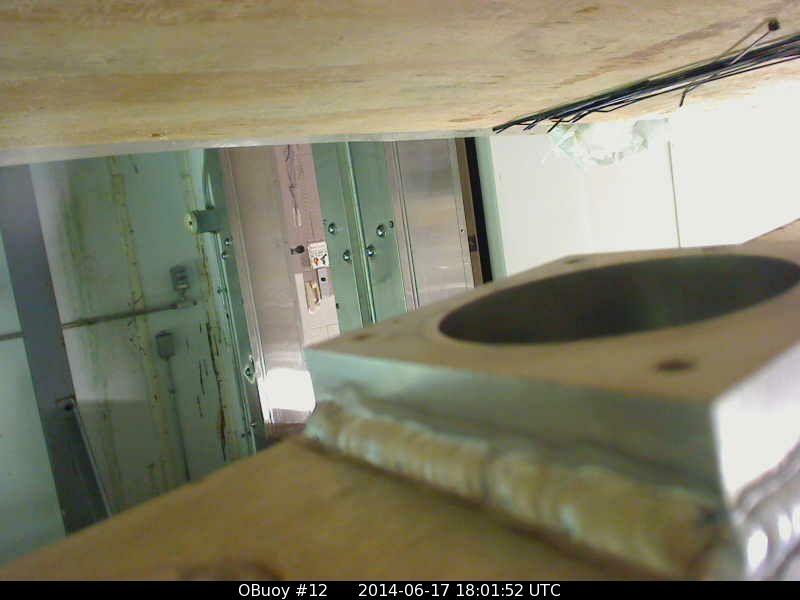 Then it is two feet thick. And so on. So where is the melting occurring? If you have neither the time nor patience to bring up the points I have just made, it is jarring to their illogic if you simply bring up what was stated back in 2007. Back then the Antarctic ice had been decreasing a little, after the hugely warm El Nino of 1998, and we were assured it was “settled science” that Antarctic ice would continue to decrease. This decrease was very important to the big picture of Global Warming. 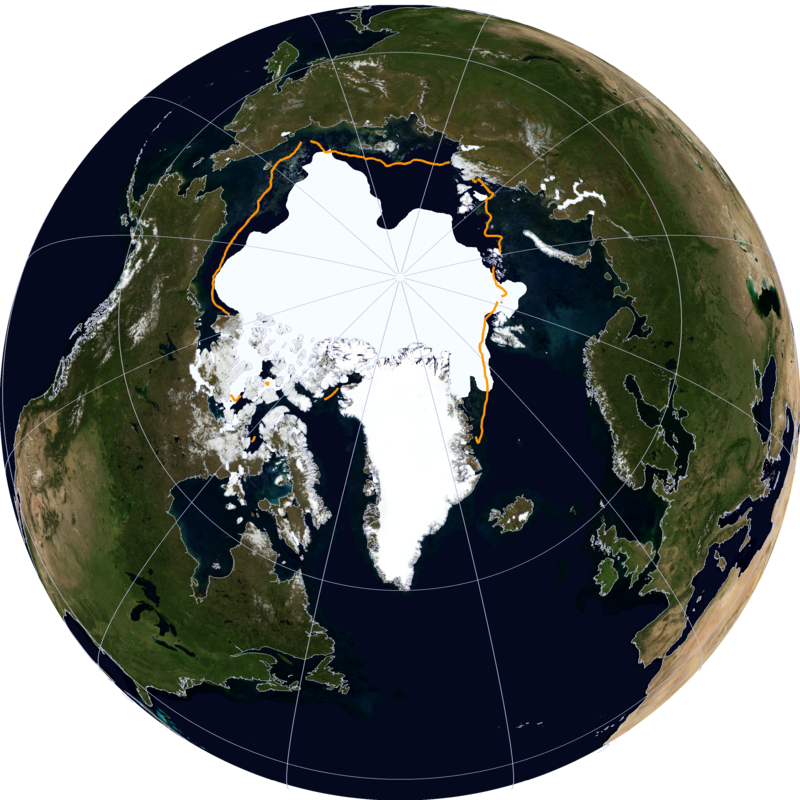 We were told there was a magic word, “albedo.” Basically the idea was that white ice reflected warm sunlight, while dark, open water absorbed warm sunlight, and therefore less ice would make for warmer oceans, further sea-ice melt, and a dangerously warmer world. 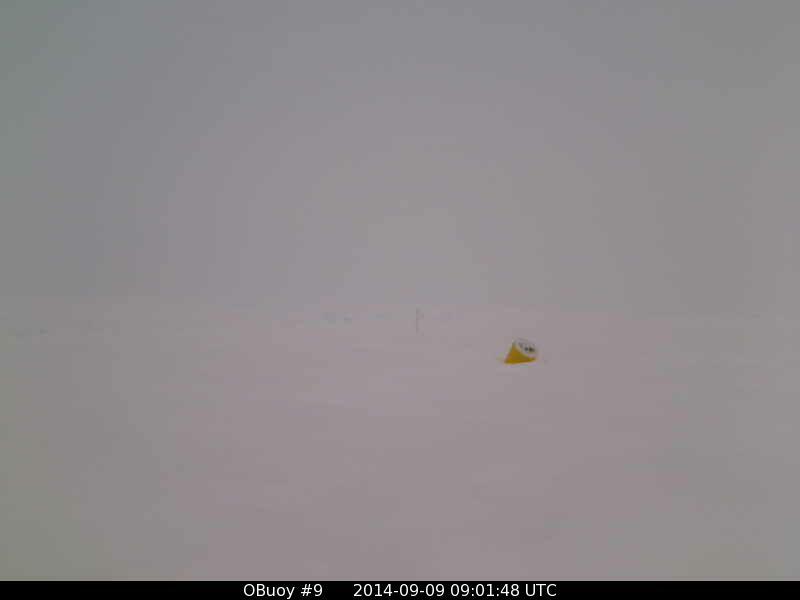 We were assured that it was an established fact that the sea-ice was melting away. I have the strange sense that using the word “albedo” will soon become politically incorrect. 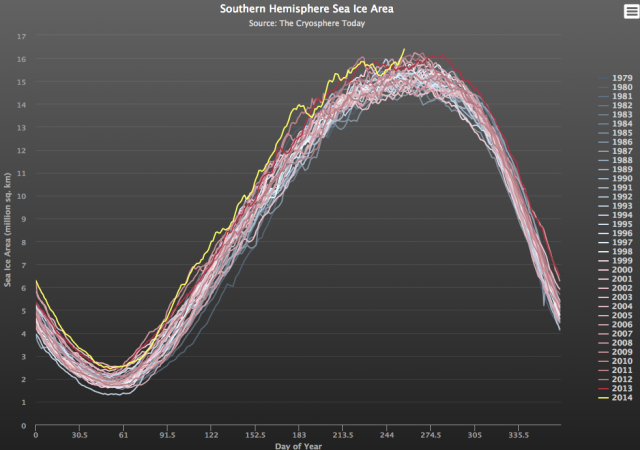 ANTARCTIC SEA-ICE RECORD DESERVES HEADLINE? The amount of sea-ice around Antarctica hasn’t merely broken the recent record by a small amount. It has smashed it. We are talking roughly a million square kilometers more ice than ever before. Nor are we talking of ice up at 80 degrees latitude. Some of this ice is north of sixty degrees latitude, close to fifty-five degrees, south of Africa. Imagine the Atlantic frozen from Labrador across the Atlantic, south of the southern tip of Greenland, well south of Iceland, to the northern tip of Scotland and southern tip of Norway. That is sea-ice at sixty degrees latitude. Imagine the “albedo” equations involved in having all that ice, a million square kilometers, reflecting sunshine on the first day of spring. Nor is the sunlight low and slanting at that latitude. It is higher and more direct. The above graph demonstrates they were thunderously wrong. It is a repudiation of their ideas, carried out by Mother Nature. It deserves headlines. Why is there deafening silence? 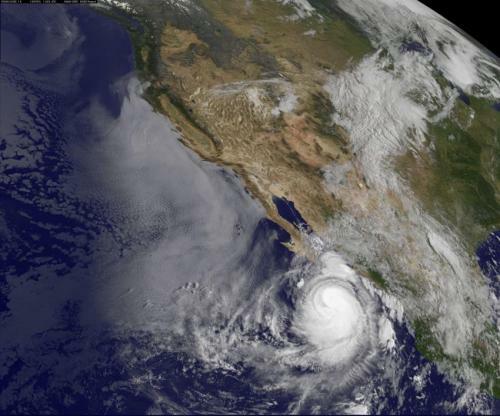 With the remains of Hurricane Odile rushing north from the Gulf of California, alarmists such as Bill McKibben are likely to suffer their usual anxiety attacks, and to describe the event as “unprecedented.” The flooding may be worsened because it was preceded by moisture brought north by “Norbert,” and likely will be followed by moisture swept north by “Polo”, (even if Polo veers out to sea.) McKibben may then state that the number of storms coming up the west coast of Mexico is “unprecedented”, as well. Because I was alive in 1976, I recall the desert floods, the heat and drought further north in California, and the bitter cold that followed in the east. I am always watching to see signs of a repeat of that nasty winter, when sea-ice formed in harbors as far south as Virginia. Perhaps they are merely lucky, like a gambler in Las Vegas on a “hot streak,” but I find it impressive when they post illustrations like this one of Kathleen back in 1976, and then Odile takes a similar route only a few weeks later. I notice that the year “1976” again appears, as number five in the five driest years (at this point) in the High Sierra. This makes me a bit nervous, as during the winter of 1976-1977 that followed temperatures dropped to minus thirty, in my neighborhood in New Hampshire. This situation actually gives McKibben an splendid opportunity to put his skill at fretting to good use. He claims to be concerned about our grandchildren. I have four. Largely due to the fretting of people like McKibben, coal-fired power plants are due to be closed down this January, when temperatures are at their lowest. With no back-up power available, this closure could overwhelm the grid, and result in power being shut off when people are in danger of freezing without power. In other words, shutting down the power plants could endanger grandchildren, and not endanger them 100 years from now, but this coming January. Surely McKibben will be the first to see the reason to fret, and demand the logical thing be done. And what is the logical thing? To simply delay the closures until April. As I await seeing McKibben demonstrate his deep levels of caring and concern, outside the last crickets of summer are somberly chirping. In a nutshell, the people of the world were being asked to make great sacrifices by the United Nations, due to an unintended consequence of civilization they dubbed “Global Warming,” which was portrayed as being a dire threat to humanity as a whole, and even to all life on earth. It seemed to me a claim this fabulous and fantastic should be investigated, however what I noticed right away was a failure to investigate. In fact, if you even asked a question you were immediately ostracized, and to some degree blackballed. Over the years I’ve run into all sorts of discouragements, when I desired truth, and I’ve made a sort of study of how some people face the truth, and others evade it. In my younger day this curiosity led me off on sidetracks I now think I perhaps should have avoided, where I studied the world of outlaws. In that criminal world I learned a lot about how some evade answering honest questions, and learned to a degree where I mow sometimes sense dishonesty even before I know the specific question being asked. An alarm goes off in the back of my mind. My immediate response is to back away and reconsider. Then my secondary response is to start to ask careful questions. Even when the person I ask then acts hugely offended that I dare to question, and roars at me, the offence they take only backs me off temporarily, before I ask more questions, and follow-up questions, and follow-up-follow-up questions. This is what investigative reporters should have done, when the UN asked all the people of the world to make huge sacrifices. Some questioned a little, timidly, but when they saw they offended, they backed off, and dared ask no more. Only the most courageous continued to ask questions, and I include myself in that crowd. Not that I am all that courageous. In fact I’m a coward, when it comes to thinking of someday standing before my Creator, and telling Him why I didn’t stand up for His Truth. In any case, I became a so-called “Skeptic”, and questioned Global Warming. My conclusion is that the huge sacrifices the UN is asking humanity to make are not only unnecessary, but are harmful. They do not benefit humanity. They lead to more hunger and poverty, and offer no return. Even those in the UN who receive a hefty paycheck for promoting this mad policy are likely to eventually face a backlash that will make them rue the day they ever bought into the scam. 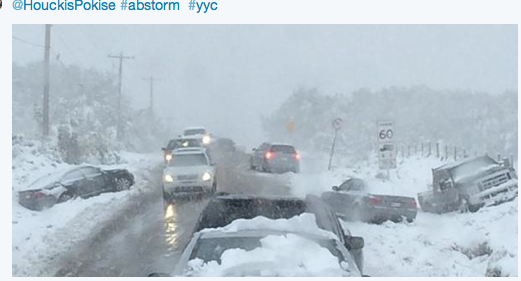 The entire “Global Warming” scare is a case of unmitigated and worldwide madness. If you look back through these posts you only see the last year out of seven years of questioning. Also it only involved sea-ice. I have thought long and hard about other subjects as well. However those subjects must be a subject for another post on another night. Tonight I’ll keep things simple. The Climate Scientists assured us the arctic was in a “Death Spiral,” and that by this summer the Pole would be ice-free. Plainly that is poppycock. It does not take seven years of study to see it, either. 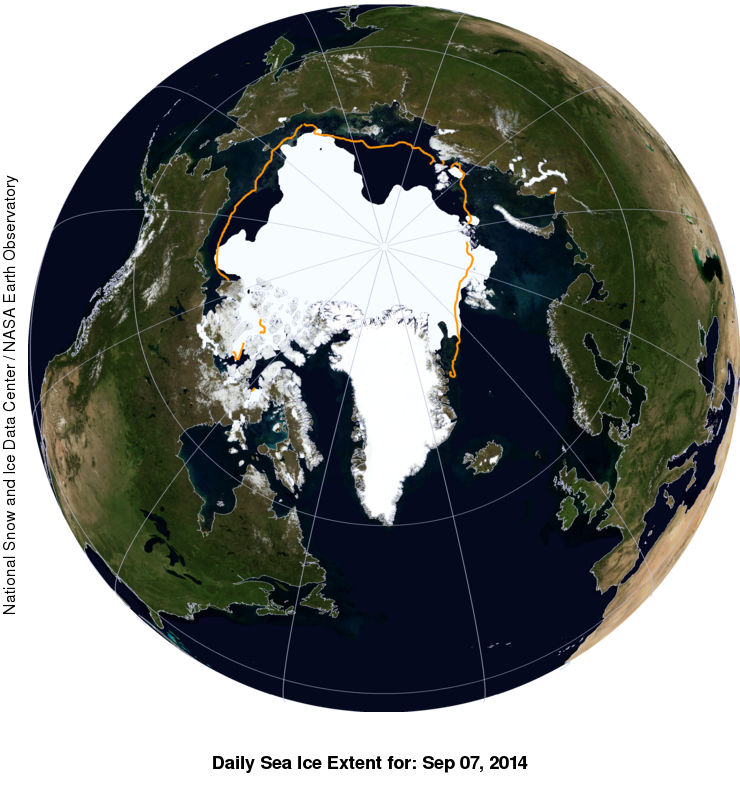 Our current extent is shown by the red line in the graph below, and it is obvious this year’s extent is not less than last year’s, and certainly not as low as 2012’s, and no where near an “ice-free” state. That graph alone disproves the entire concept that builds up the idea of a “Death Spiral.” It is a concept that bases much on a magic word, “albedo,” which measures the sunlight reflected back into space. The idea was that white snow reflects a lot of sun, while dark blue sea-water absorbs sun. 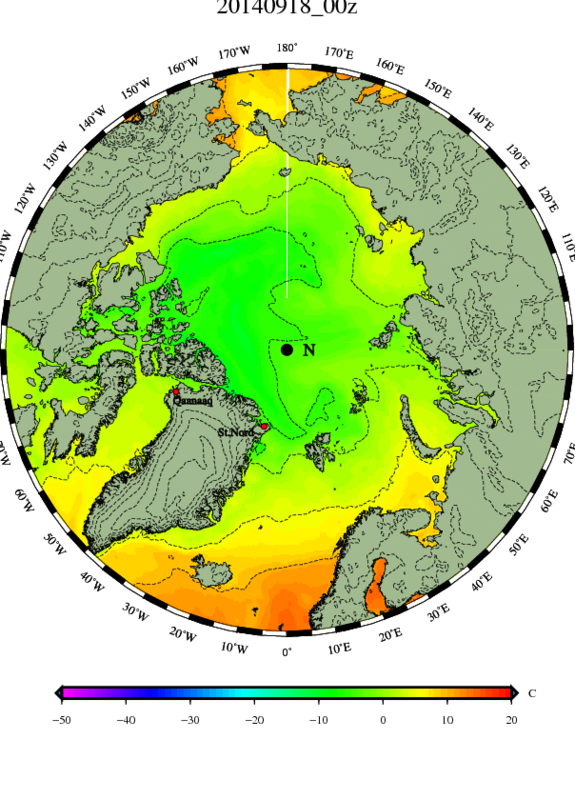 Therefore, if the sea became ice free, it would absorb heat, and melt more ice. This would lead to more open water, which would absorb even more heat, and melt even more ice. It was a vicious cycle, in theory. However when you look at the lowest, purple line on that graph, you see that in the summer of 2012 the Arctic Ocean had the least ice it’s had since 1979. Rather than so little ice generating a warmer sea and less ice, we have seen two consecutive years where ice has increased in area and volume, (if not extent.) That is simply impossible, according to the “albedo” theory. The theory has been proven false by Reality, irregardless of human politics or who gets funding from what source. The Alarmists who refuse to face this Reality are ridiculous. There is no other way to describe their behavior. 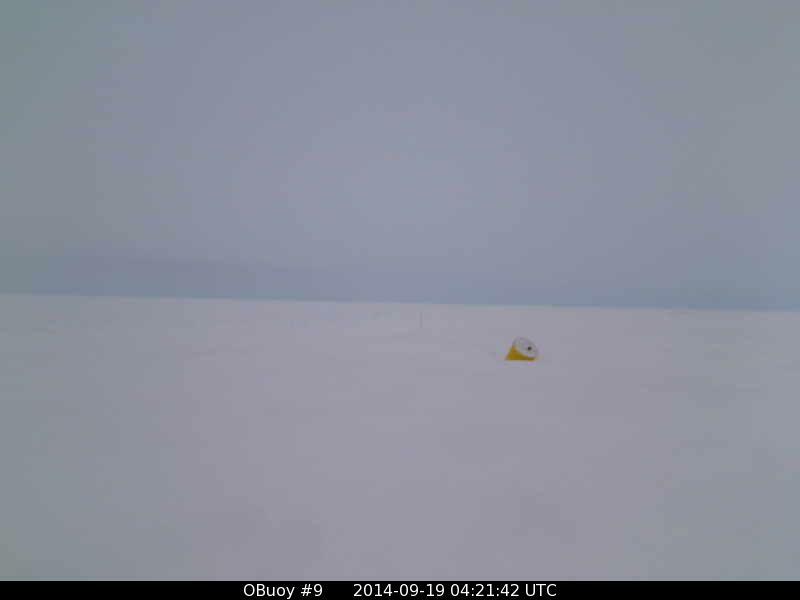 Their pet “albedo” theory is a Titanic that has hit an iceberg, but they refuse to admit their ship is sinking. At the very least they should state their theory needs to go back to the old drawing board, and undergo some serious tweaking, but they refuse to even say that. Instead they claim their theory is reality, and Reality should be ignored. I really have no time for such buffoons. They have caused serious harm, and some of their chickens are coming home to roost in my own neighborhood. I honestly have no further time to spend pointing out Reality to people who call me a “Denier” for not denying what they deny. Therefore I doubt I’ll continue these posts for long after the minimum. I’d actually like to do so, for I find the arctic Reality a beautiful and refreshing subject to contemplate. In fact, I so need beauty and refreshment that I think I will continue these posts, but they will be scaled down. I will post maps and pictures, but comment less. My comments will be found in a new series, which will describe a part of the USA about to suffer power shut-downs in the dead of winter’s most brutal cold, to “save the planet.” Alarmists go on and on about how we should close coal-powered power plants for the sake of our grandchildren, and have succeeded in closing a crucial one in my neighborhood. However I actually have four grandchildren, and they will actually freeze if the power is shut off this January. Therefore I have got to do stuff an old geezer like myself ought not do, such as chainsaw firewood, to make sure my grandchildren don’t freeze. 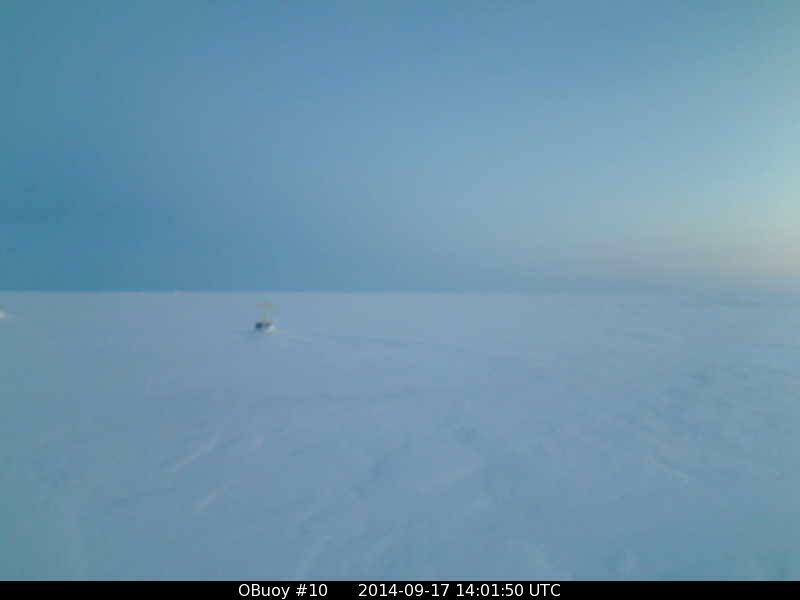 I think a description of that struggle will be far more interesting than what sea-ice is up to when you ccan’t even see it, after the sun has set in the frozen north. As this series of posts winds down I’ll continue to post DMI arctic maps twice a day, and pictures from the cameras until they shut them down, but my comments will dwindle away. If you happen to enjoy my brand of grouchy-old-man commenting, you’ll have to endure my cussing on a new series which will focus on a different local than the North Pole: A small town in New Hampshire. It used to be like a Norman Rockwell “Saturday Evening Post” cover, but I suspect it won’t be so quaint when the power goes off in January. I’m not sure what to call the new series. “Grumpy For The Grandchildren” springs to mind. Any suggestions? Fir the first time in a while we actually have a textbook map, with a high over the Pole and lows rotating around the edges. This situation will likely be short-lived, but while it lasts the cold should build at the Pole. First time visitors will have to forgive me for naming the lows. It is an outlet for my creative sense of humor. 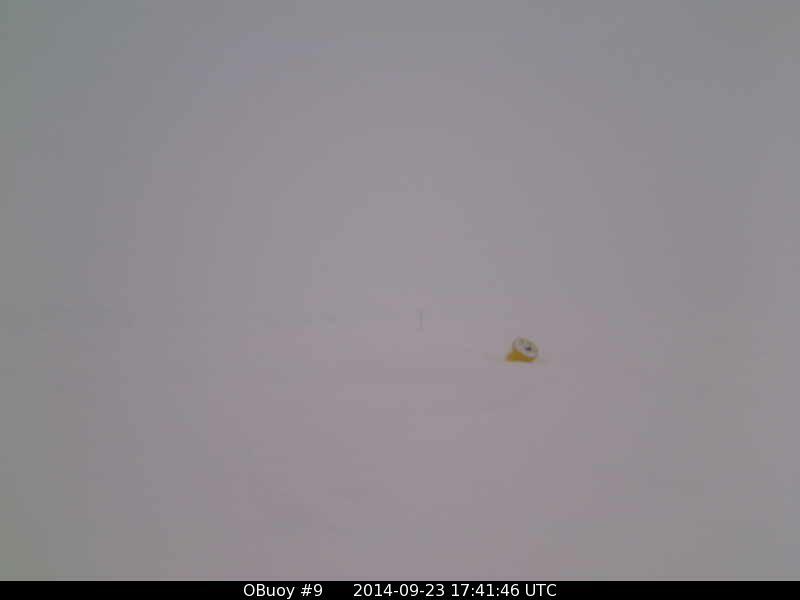 The low north of Iceland is “Tobal,” and is what is left of Hurricane Cristobal. It is bringing a southwest surge from Scandinavia, but that surge will likely be deflected east along Siberia’s arctic coast, and will not invade the Arctic Sea. The low north of Alaska is “Steppenwolf,” who has had a long and interesting life, (see earlier posts), but who whill likely dive south towards Hudson Bay. 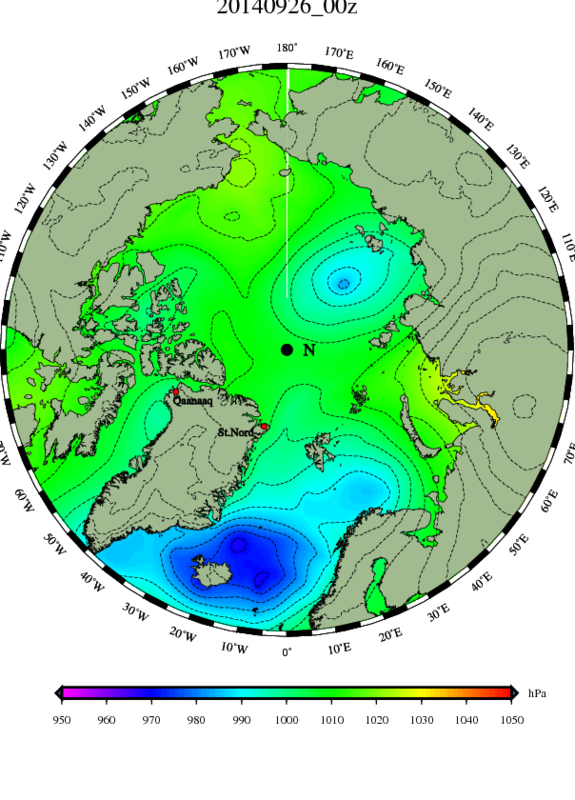 The low south of the Kara Sea is “Artless,” and is likely to move up through the Laptev Sea and displace the high pressure from the Pole by next weekend. 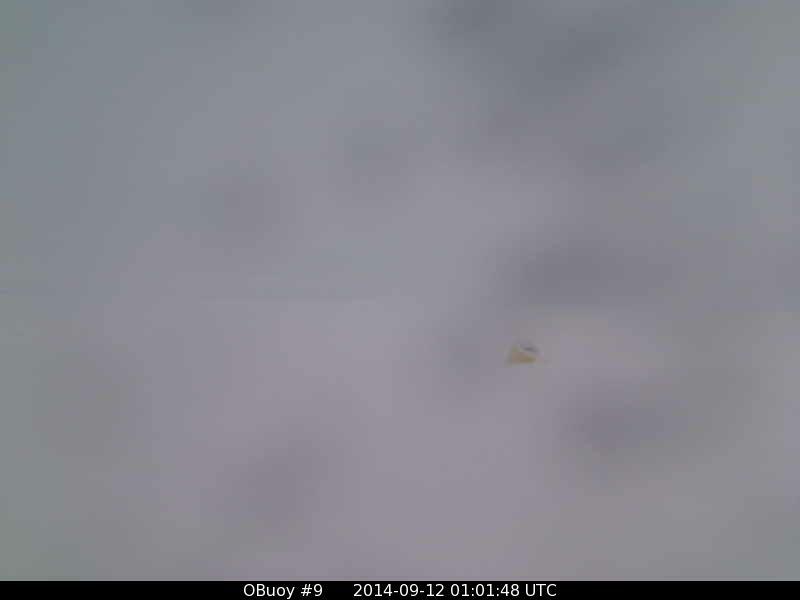 The northern camera shows light winds, and temperatures diving down towards minus five. The southern camera shows breezes of 10-15 mph, and temperatures sinking after flirting with a thaw. 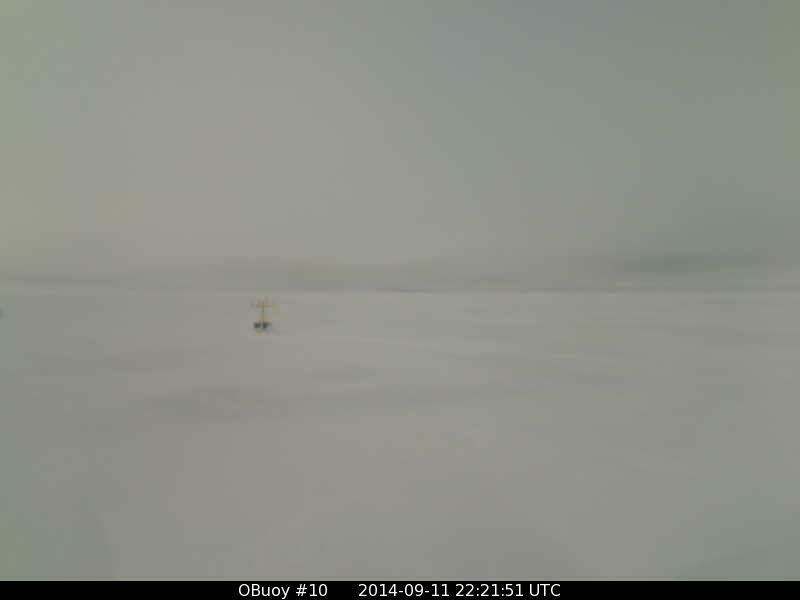 The northern Camera frosted up as winds picked up to 15 mph and temperatures dropped down nearly to minus ten. 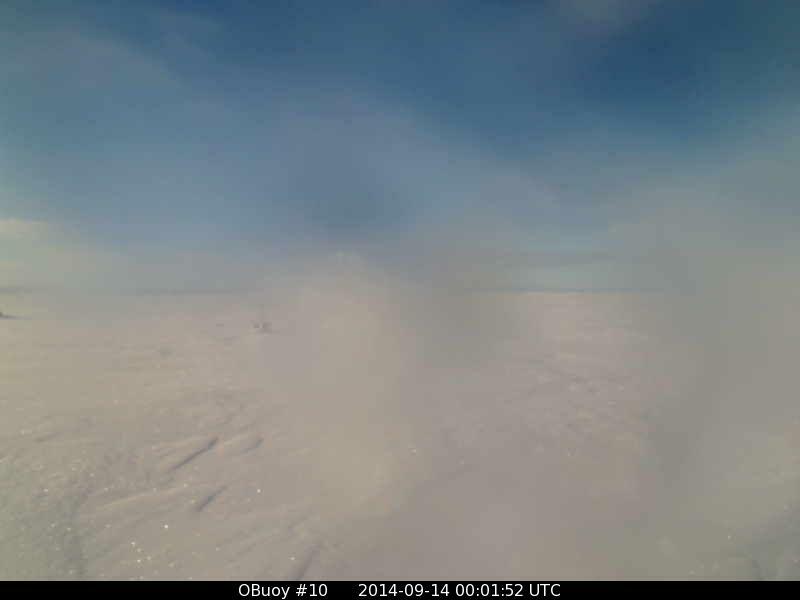 Meanwhile our southern camera likely experienced north winds behind “Steppenwolf”, (pushing the sea-ice south towards Alaska), and temperatures in the minus 2-4 degree range, which is colder than it has been, as it frosted up. 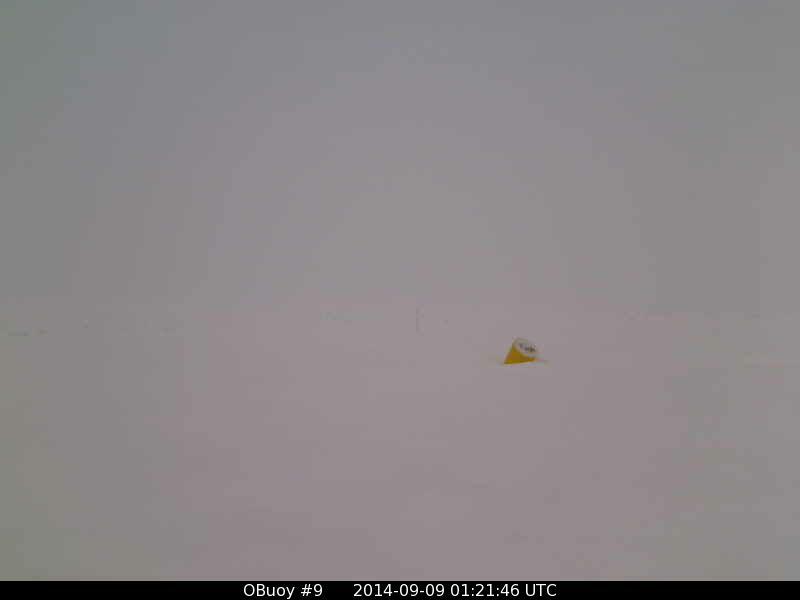 Cold is building over the Pole. There’s an interesting above-freezing patch north of the Laptev Sea. That sea seems a sort of storm-magnet until it freezes over. Our southern camera has seen temperatures hover around minus three, with winds of 10 mph. Southern camera hasn’t updated since the blue twilight. In the brief two-day period that high pressure dominated the Pole we have seen temperatures drop at least five degrees up there. We have gone from seeing no areas bounded by the minus-five isotherm to seeing half the area bounded. 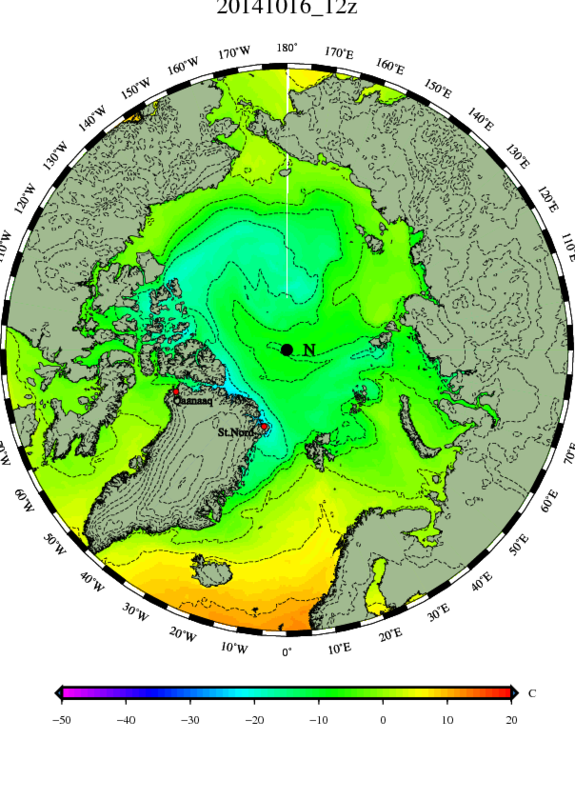 Now that high is fading towards the Pacific, as the low “Artless” squeezes north from the Laptev Sea, and in two days low will dominate the Pole, and swirl that cold around. “Artless will be the boss, and other lows fading. “Steppenwolf” is fading down into Canada, as “Tobal” has been squashed like a ripe tomato north of Norway bu a strong high pressure that built over northern Europe. A very weak low “Nosee” is southeast of Iceland and will drift into the North Sea, never growing strong but being a fly in the ointment in terms of nice weather for Scandinavia. Another low “Na” has appeared southwest of Greenland, and in some models is a player as it undergoes what I call “morphistication” transiting Greenland and heading to the Pole. In either case the end result is a stormy Pole, and what will be our last chance to reduce the “extent” graph, although I suppose the winds might also spread out the ice and increase the “extent” graph. SADLY, WE HAVE NO POLAR PICTURES THIS MORNING. I’LL CHECK LATER. It’s later, 10:23 EST, and still no updates. Hmm. I wonder if their funding’s cut. They are just sitting there, as they have been sitting since June. All that money invested into perfectly good equipment. Why aren’t they deployed? It better not be because we can’t afford an icebreaker. We could raise that money real fast if we’d just fire Mark Serreze ( of “Death Spiral” fame) and a few others of his ilk. They likely have a six-figure salary, but what good do they do, in terms gathering data and increasing our knowledge? Maybe they once did some fund-raising, with all their doom and gloom, but now the opposite is likely true. Politicians don’t take kindly to being made to look like jackasses, and they do look like jackasses, after making speeches about how the Pole would be ice-free if they didn’t raise taxes. It would make them happy if Mark Serreze was made into a sort of scapegoat. He’d get the blame, get the ax, and there would be an immediate quarter million in the budget to spend putting out real scientific, data-gathering buoys, and fixing the ones we already have. Simply returning toi normal, temperatures must crash, for it is normal for temperatures to crash, at this time of year in the arctic. Very soon we will be seeing the minus-ten isotherm in the DMI maps. YIPPEE!!! 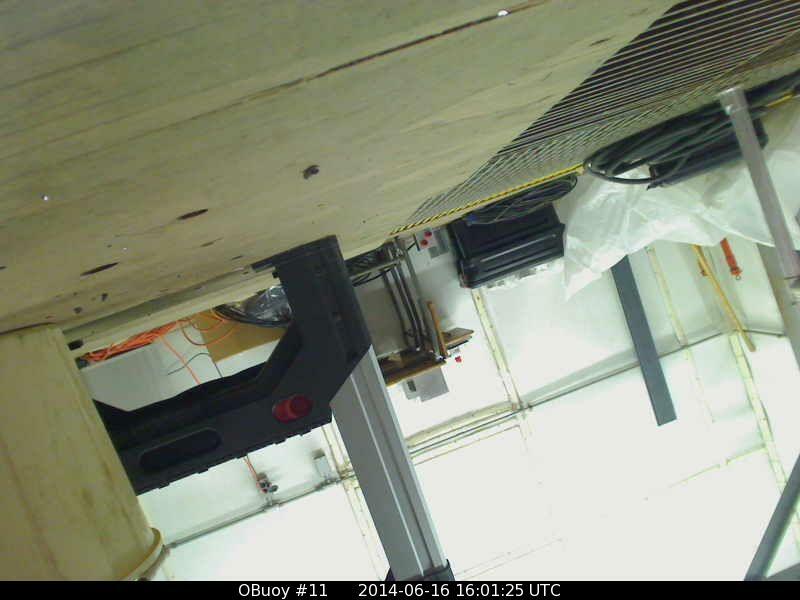 NEW CAMERAS POSTING PICTURES! Our northern camera is looking out over an increasingly cold world, now more than minus ten below zero Celsius, with light airs of 2 mph. 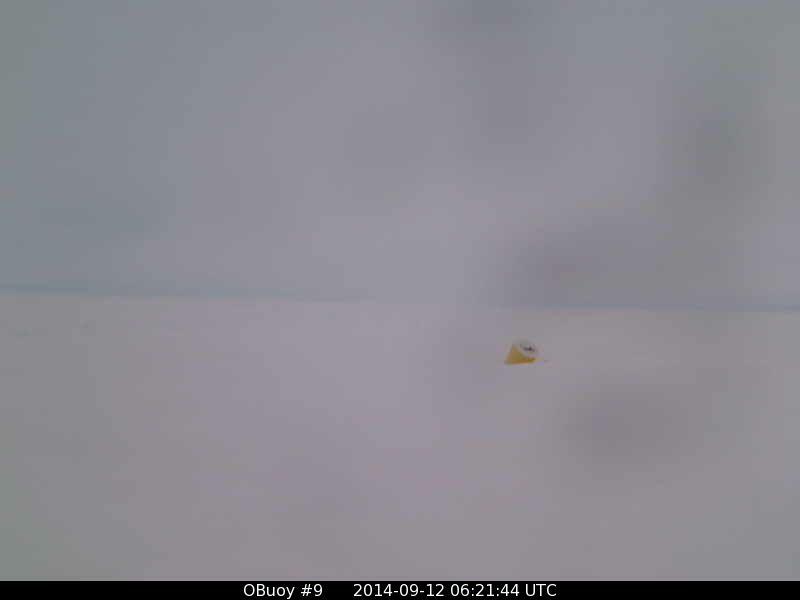 464.86 miles towards Svalbard, at Buoy 2014E: the temperature is -4.02 C. At these temperatures the sea between bergs starts to skim over, providing the wind is calm. 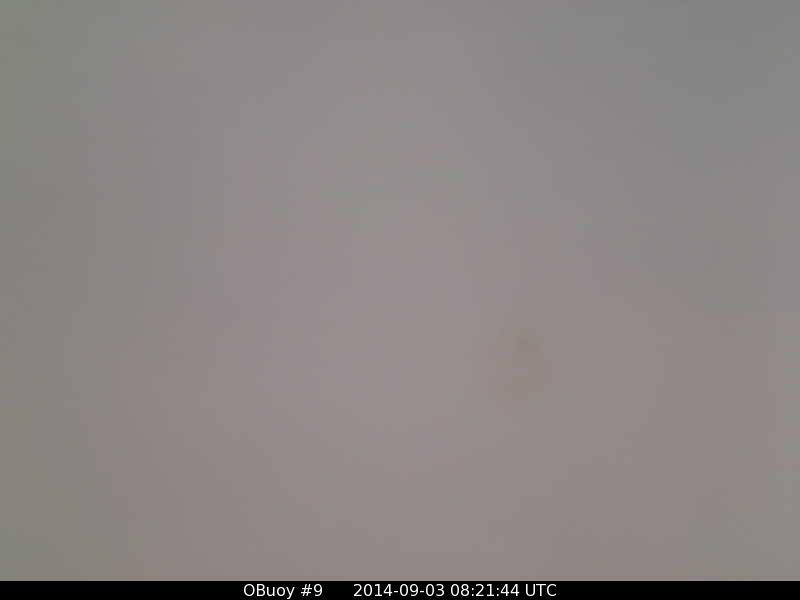 At our southern camera the bleary view hints at freezing fog. Hopefully at these low temperatures the frost will sublimate off the lens and we can get a better look at the darkness on the horizon. 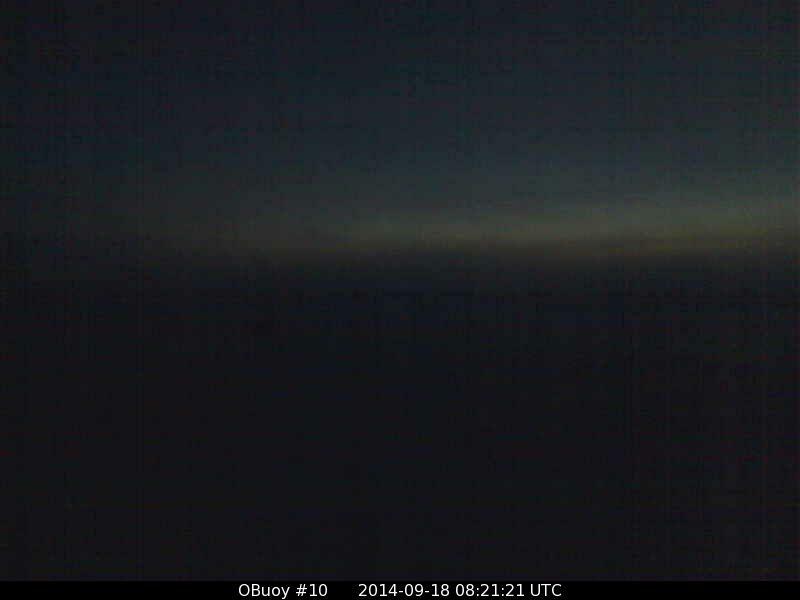 Likely it is a wall of fog, but there is a slight chance it is the darkness of open water reflecting off low clouds. 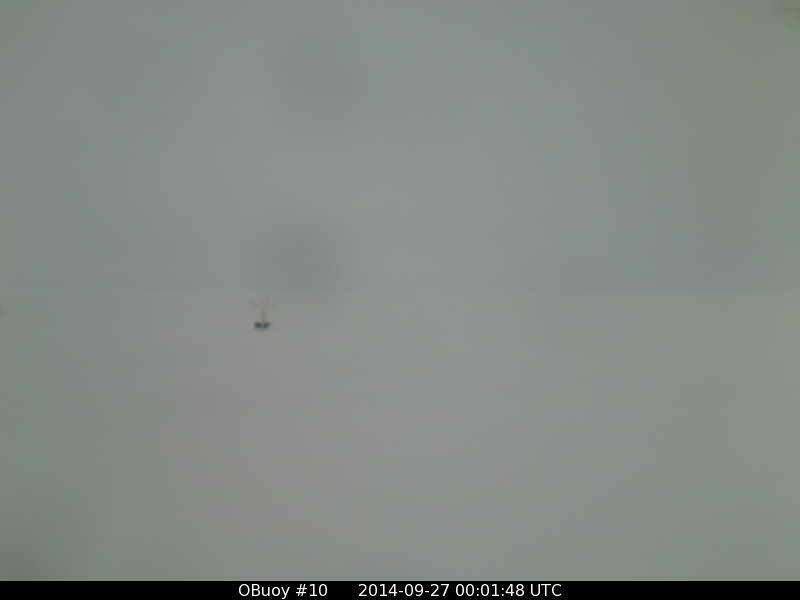 At 1200z conjunct Buoy 2013F: was reporting -4.67 C 461.51 miles to the west, north of Wrangle Island, Buoy 2014B: was reporting -1.57 C. To our south 161.41 miles, Buoy 2014C: is reporting -3.96 C, as to our east 168.4 miles at Buoy 2014F: the temperature is down to -7.54 C.
I have a hunch that the import of warm air to the Pole breeds cold, though I haven’t a clue how it works. When I saw “Steppenwolf” bringing a blob of Siberian warmth north, and also saw the warmth being sucked north through the Canadian Archipelago, I simple said we should expect cold. Now you see it, though it doesn’t make sense in some ways. It is bad arithmetic, (something like 1+1= -2,) for warmth+warmth= cold. As “Steppenwolf” fills and fades into Canada, the next big boy on the block is “Artless,” now stepping out from the Laptev Sea to claim the top of the world. If you look at his isobars, you will see a point jutting towards east Siberia. I imagine that is some sort of warm front or occlusion, but some models see that innocuous feature brewing up a storm bigger than “Artless,” which I can;t really see but have already named “Artlesszip.” As “Artless” fades and fills “Artlesszip” will bring reinforcements from the Pacific side. Meanwhile models also see reinforcements coming from the Atlantic side. The Atlantic reinforcement is not due to the former hurricane “Tobal” that slammed into Iceland a couple of days ago. Let this be a lesson to you Scandinavians. You have a power to defect mighty storms. In terms of isobars, “Tobal” was mushed into a banana leaking over the top of Norway. In terms of moisture, most of Tobal rained-out or snowed-out over Greenland and Iceland, as Scandinavia wondered, “Former hurricane? What former hurricane?” Perhaps a little moisture leaked across and fed into the weak low “Nosee” east of Iceland, on its way to being a North Sea Low that never gets stronger than 1006 mb. It just acts a counterclockwise gear between the clockwise Azores high and the clockwise Scandinavian high. It will be an annoying little storm, capable of messing up forecasts for fair weather in the Baltic, but for the most part high pressure is in command, and beat the once-mighty former-hurricane Tobal into submission. A huge surge of tropical air came north, and basically was blunted onto a curving stream north of Norway. 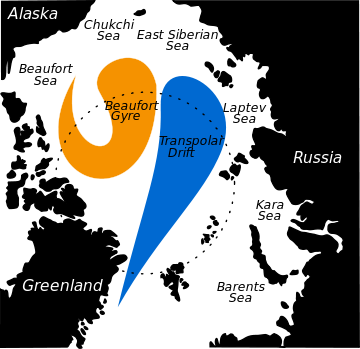 Even as the very noticeable Atlantic reinforcement “Tobal” comes to naught, “Na” crashes into the 10,000 foot tall icecap called Greenland, and appears to come to naught, but, through the mystery of “morphistication,” will reappear as an entity on the other, eastern side of Greenland, and become the power Tobal failed to be. It will charge the Pole from the Atlantic side, as an Atlantic reinforcement, even as Artlesszip charges the Pole as a Pacific reinforcement. This will make mincemeat of the nice, quiet and tidy situation created by having a textbook high pressure sitting atop the Pole. That pool of minus-five isotherms will be stretched out to ribbons, mixing with ribbons of warmer air. It will be a total mess, and I doubt very much there is any computer model that can guess the outcome, however that outcome, whatever it is, will effect the weather to the south, most obviously in sub-arctic regions, but to a lesser degree right down to the equator, and occasionally beyond. However the fact a mountain range wipes out a storm at the sea-level mentality of surface maps does not mean that those same mountains reached high enough to even touch the upper-air reflection of that storm, and that upper-air reflection transits the mountains. (I will not say it transits the mountains unscathed, for it has lost its bottom, which none of us wish to ever experience.) As it arrives on the other side of the mountain it of course effects the lower levels. In the USA we see a double-morphistication of storms. A huge Pacific gale hits our Rocky Mountains, and is wiped out and vanishes from the map, but a vigorous “Alberta Clipper” appears on the east slopes. It becomes a blizzard on the Great Plains as it growls east, but it too gets wiped out and vanishes from the map when it hits the smaller Appalachian Mountains to the east of the USA, but a vigorous “Nor’easter” appears over the coastal waters and, if “bombogenesis” occurs, coastal cities to the north get slammed. Surely those who live in the lofty realms of upper-air-maps could assure us that it was not three different storms, but a single storm, that crossed the USA, in the above example. However I have learned those fellows are useless, when it comes to the nuts and bolts details of the down-to-earth level. When the Pacific storm approaches our west coast, they are no good at saying what to expect on the east coast. They live in an Ivory Tower, and have about as much practical use as a psychologist does, when you need heart surgery. In terms of forecasting you need to see the upper air, as it effects what is under, but you also know what is under effects what is above. You need to hold two views at once. Before you state this is impossible with weather maps, I would like to point out that, unless you have been unfortunate and lost an eye, you have two eyes that have two views. Neither eye has depth perception, but together they do. In terms of meteorology, I am a cyclops. I lack the depth perception of seeing both upper air weather and ground-level weather. However, if I was young, I would seek the older meteorologists who truly have the depth perception which requires two eyes, and I would steer clear of ever becoming lazy and dependent on computer models. As “Artless” moves north from the Laptev Sea, his east side’s south winds are bringing Siberian air north. It is afternoon in that part of the map, and the air is relatively mild. This likely is one of the last times we’ll see Siberia be “warm” this year, as already the nights are getting frosty over the Taiga and Tundra. A single light snowfall will change that entire huge chunk of the northern hemisphere from an area that produces mosquitoes to an area that kills them dead. In two weeks the nights will start to be longer than the days, radiational cooling will occur over an area bigger than the USA, and a map like the above map will see south winds from Siberia bring north air that is colder than the cold the Pole can produce. Therefore enjoy the present, while it lasts. Right now the Pole is colder than the adjacent land, and able to create a cooling sea-breeze when the afternoons warm the land, but in a fortnight things will flip, and that same Arctic Sea will be a warm sea, compared to the amazing cold of Siberia. In January you can see winds of minus-seventy move out over the Sea, and, even with the ice insulating the water to some degree, the water loses so much heat that the air warms thirty degrees, and is “only” minus-forty. I figure the storm brewing over the Pole will be the last chance to put a sizable dent in the extent-graph. Of course, if it involves much snowfall, or much spreading-out-of-ice, there just as well could be an up-tick. It will be interesting to watch, over the next week. 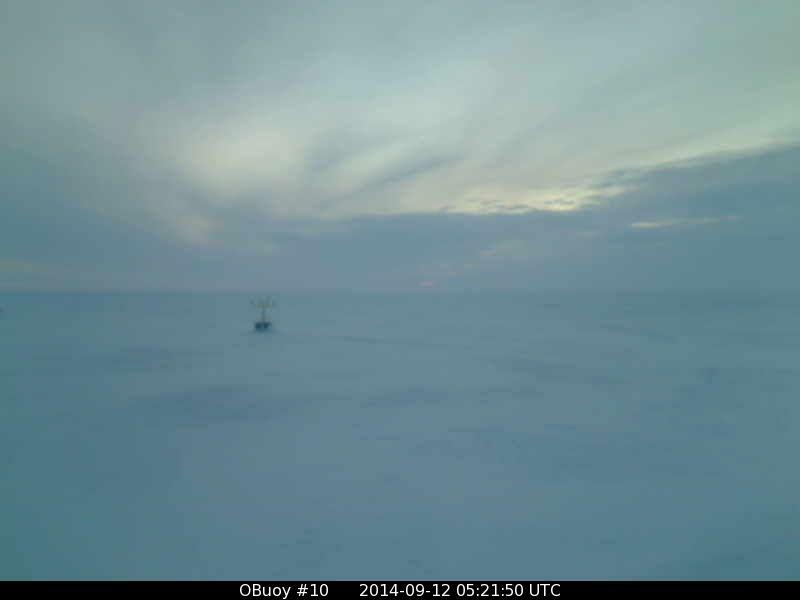 The northern camera is seeing slowly warming temperatures, though they are still below minus-five. The near-calm has been stirred by light breezes increasing towards 10 mph. 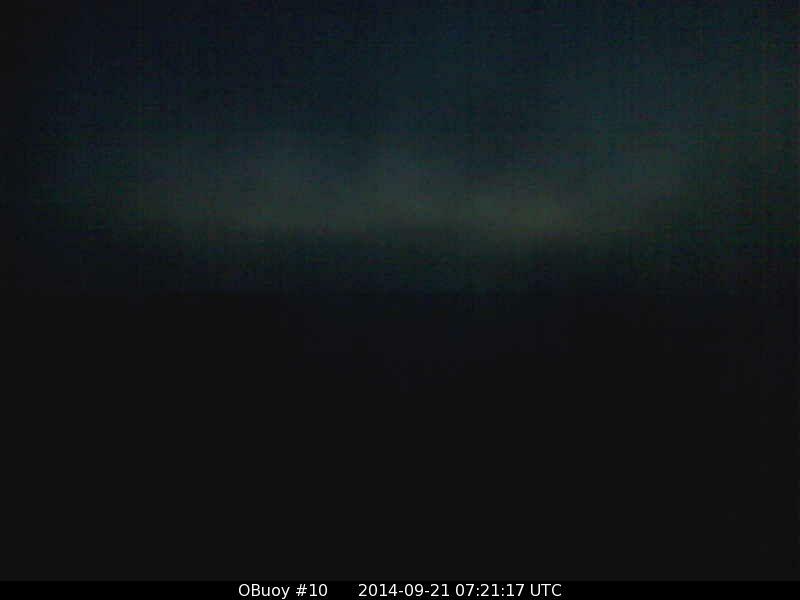 The dark strip slanting up to the left along the horizon may be a relection of a lead of open water over the horizon. We’ll have to see if it is still there later. The southern camera shows a definite warming trend, likely due to a southerly flow ahead of “Artless.” It also shows the closest thing to night we have seen in months. 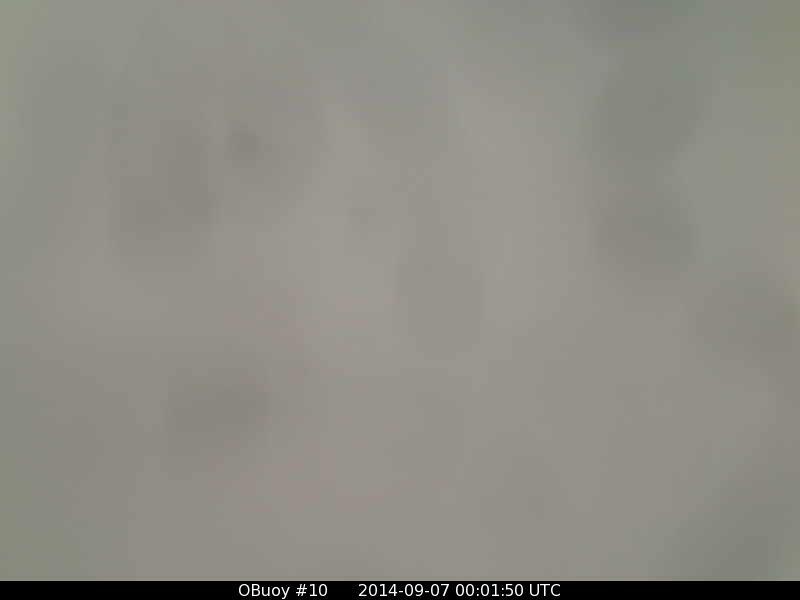 I think snow is on the lens. “Artless” is bringing a slug of above freezing temperatures north. Watch how fast that air cools. Meanwhile “Na” approaches from the Atlantic side as “Artlesszip” forms on the Pacific side. Models suggest “Artless will fill and basically vanish, as the two approaching storms do a Fujiwhara dance around the Pole. When they fade after midweek, other storms come north. It looks like a very stormy Pole for a while. The Azores high and Scandinavian high are blocking the cross-Atlantic, and the weak but very complex low “Nosee” spins its wheel in the North Sea, as another weak low sits stalled west of Spain. “Nosee” will be a pest, for Scandinavian weather forecasters. With this blocking in the way a storm track heads up the east coast of Greenland, with post-morphistcation pieces of “Na” like a string, (“Na” over Svalbard, “Nason” west of Iceland, and “Nathree” down by Cape Farewell.) About to join this parade is “Na2,” over Labrador, on its way to a crash with Greenland. The northern camera had the best views, especially as it was very hot here in New Hampshire today, until a thunderstorm cooled us in the afternoon. 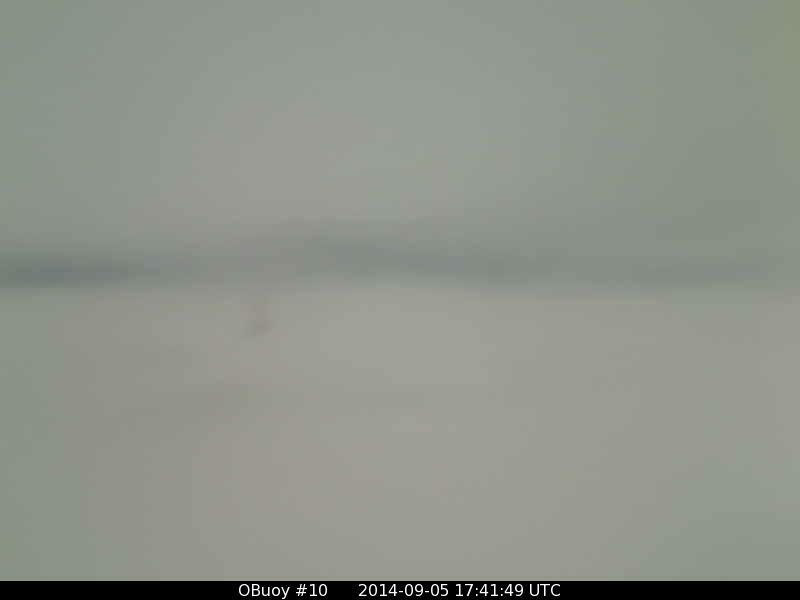 The heat made the sea-ice attractive, though the thunderstorm made me shut down the computer and go out onto the porch to watch. My dog came along to watch with me. In the middle of the storm I saw the lowest cloud-to-cloud bolt I think I’ve ever seen, right overhead. There was only a half second between the flash and then a wonderfully electric and crackly thunder, without the boom cloud-to-ground bolts make. Up to then my dog had been calm about the flashing and noise, but after that bolt she looked at me, and then nonchalantly ambled off the porch and crawled under the steps. Temperatures have warmed a little above minus-five at the northern buoy, with increasing clouds and now fog, and the breeze stiffening to over 15 mph. 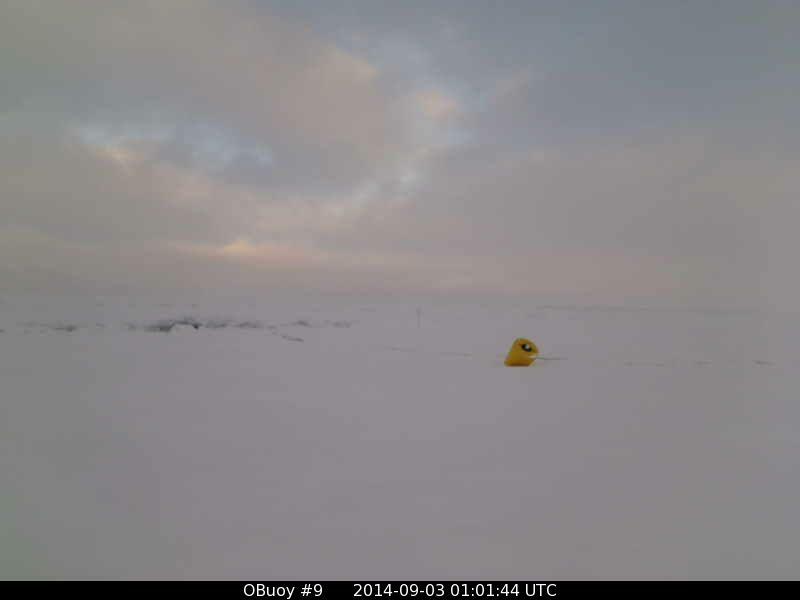 The colder air seems to have swung south to Buoy 2014E:, which is reporting -8.96 C.
Meanwhile the southern camera saw nothing but snow on the lens. Temperatures have dipped a little below freezing, and wind that were up around 20 mph have dropped to 15 mph. It is interesting to think back to last week, when the models could not decide if the Atlantic side storm or the Pacific side storm should be the focus. The answer was, “both.” Between those two clockwise gears the clockwise “Artless” is finding life a bit of a grind, and ot will basically unravel and vanish. Then the Pacific-side “Artlesson”, which was barely noticeable even a day ago, will take over and rule the roost, as the Atlantic-side “Na” dodges down into the Kara Sea. “Na” is marking out a northern storm track that moves up the east coast of Greenland west of Iceland and then across south of Svalbard but north of Norway. This should put Britain and Scandinavia in a mild southwest flow, and build a nice, autumnal high pressure, but first they need to get rid of the annoying “Nosee,” which is at the very bottom of the map. It is lodged between the Scandinavian and Azores highs, and keeping those two highs from merging into a single sunniness. In the above map you can still see a small island of above-freezing air “Artless” pulled north, just to the upper side of the Pole, but that will vanish, and “Artlessson” will be the next to draw warmth north. By Wednesday it will be weakening at the northeast corner of Greenland, and in its wake high pressure will build (and likely cool) the Pacific side. The Atlantic side will be dominated by the northern storm track, with “Nathree” and then “Na2” running north of Norway. 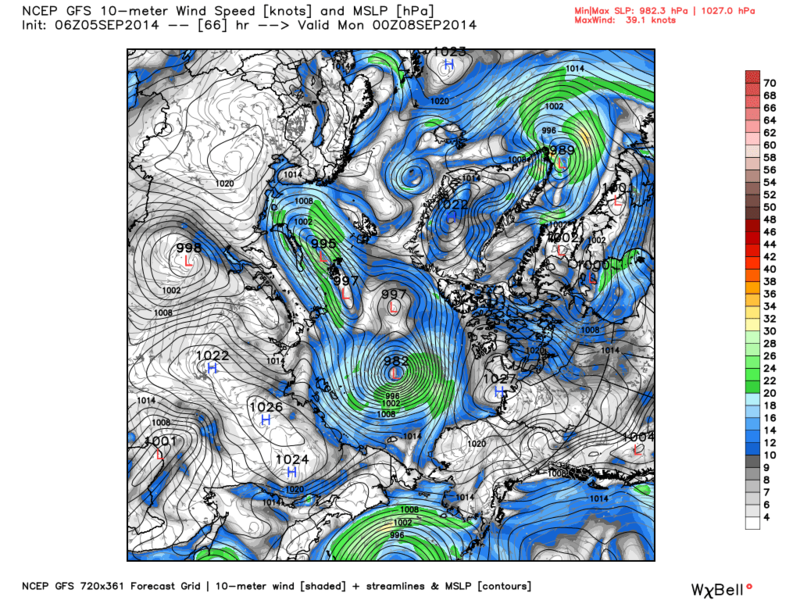 Models see “Na2” as becoming the next big storm, in the Kara Sea at the end of the week. Below are the initial Sunday-night, Wednesday, and Friday maps. Mostly I’m looking to see how that annoying, fly-in-the-ointment low pressure “Nosee” gets squeezed out of the Baltic and makes way for the Azores and Scandinavian highs to merge. The stalled low off Spain’s west coast, “Zoro” (from “Azores”) gets restrengthened by a cross-Atlantic cold front by Friday. “Na2” and then “Na3” (Na comes from “Northamerican”) crash into southern Greenland and then travel up the east coast in this sequence. By the end “Nosee” is squeezed down towards Greece. I suppose a purist would say that isn’t “Nosee,” but a secondary that formed on Nosee’s front. However, despite the goodly influence of church and a refreshing cold front that ended our heat wave, I never feel that pure as a Monday approaches. A SIGN OF A COLD WINTER FOR ME? 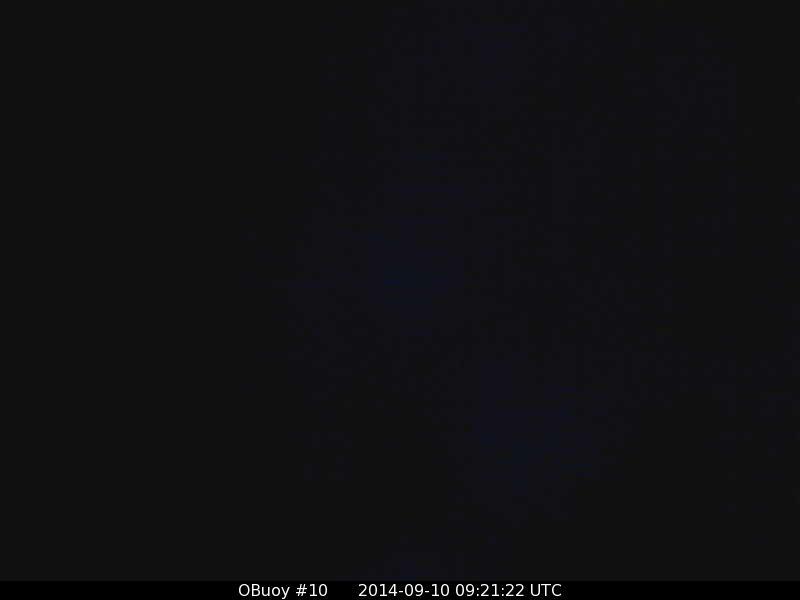 This a picture of the east pacific hurricane “Norbert.” (No, they didn’t consult me when naming it.) It is doing what such hurricanes rarely do. Rather than heading out to sea it is heading up the coast of Mexico and taking a run at Southern California and Arizona. Likely it will weaken over colder water, but if it hugs the coast or moves up the Gulf of California it may even give them a breezy day. When hurricanes take such a unusual path I’m reminded of when they did that in the autumn of 1976, and again in 1977. Both those autumns were followed by cold winters in New England, where I live. Then I won’t need a camera to see the North Pole. I’ll just look out my window. I’d best get cracking, in terms of getting a big supply of firewood. “Artlesson” is a tight little storm, and ought churn the sea-ice up a bit. It is swirling some milder air over the Pacific side, which is experiencing noon at the top of the map. Notice just above the “N” at the middle of the temperature map you can see the minus-ten isotherm for the first time this winter since June. 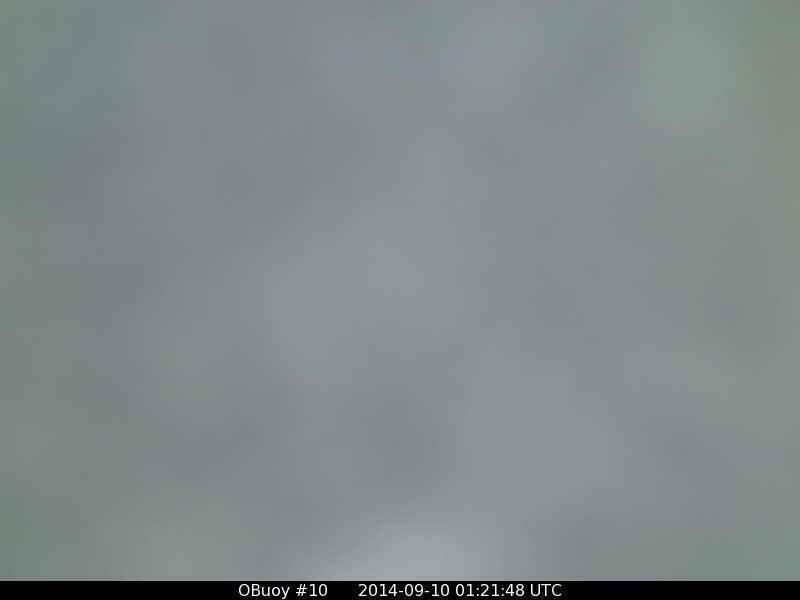 Our northern camera may be hinting at a bit of clearing, after “Artless” brought us a long spell of dull, gray weather. We could get a quasi-high-pressure, as “Artless” fills in and we sit between two storms. Temperatures and winds have dropped. Our southern camera shows a bleak scene, after winds howled over 30 mph yesterday, as “Artlesson” brewed up to the northwest. That will flatten out the landscape and tend to erase familiar features. 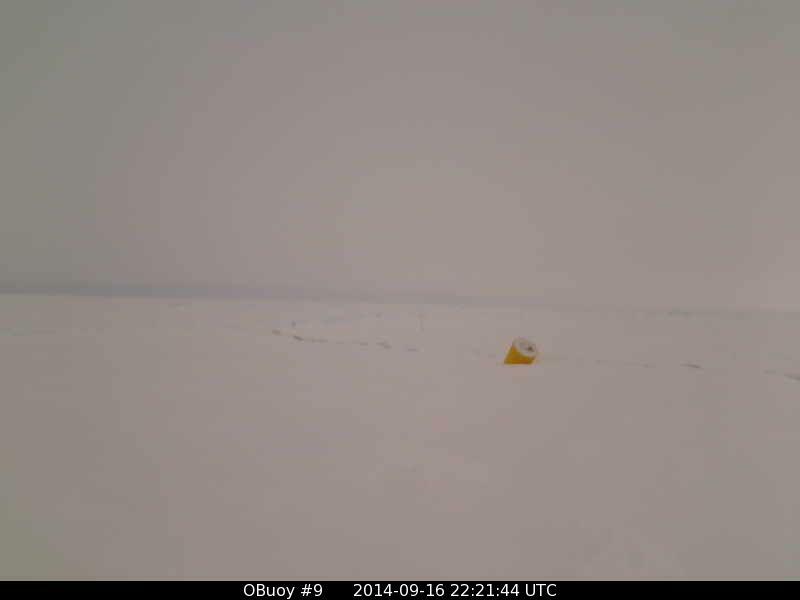 I thought we might see the ice break up a bit, but there is no sign of it in this view. Winds have slacked off to around 10 mph. We are attempting a thaw, although conjunct buoy Buoy 2013F: reported at 0000z that temperatures were stubbornly staying just below freezing at -0.69 C.
“Artless” has faded, seemingly creating some decently cold air at the Pole, as “Na” enters the Kara Sea and “Artlesson” is quite vigorous north of Canada. For the most part this set-up seems to be compressing ice rather than dispersing it, with the exception being east of Svalbard, where extents have been above-normal for some time. Besides the small pool of minus-ten air near the Pole, another pool has appeared of the northeast corner of Greenland. Molder air is sweeping around “Artlesson” along the coast of Alaska towards Canada. The map below shows the textbook situation, which of course is a rule that has exceptions. 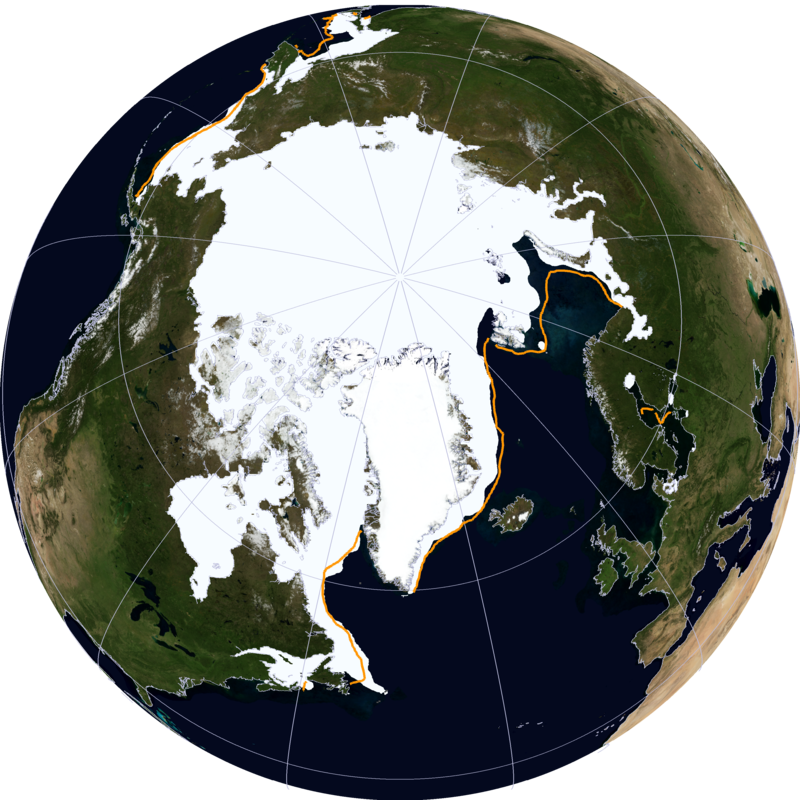 Ordinarily one would expect ice to flow from the Beaufort Sea to the Chukchi Sea, then to the East Siberian Sea, then be caught in the Transpolar drift and cross the Pole and eventually exit polar waters via Fram Strait. But not this year. 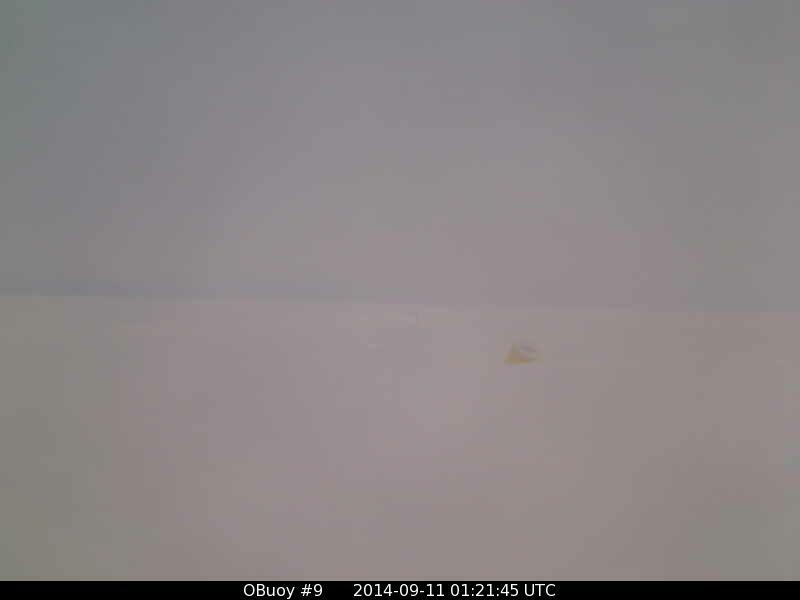 This ice also doubled back, and it too moved north and away from the Alaskan shore. On other words, the ice didn’t melt away from the shore. It moved. 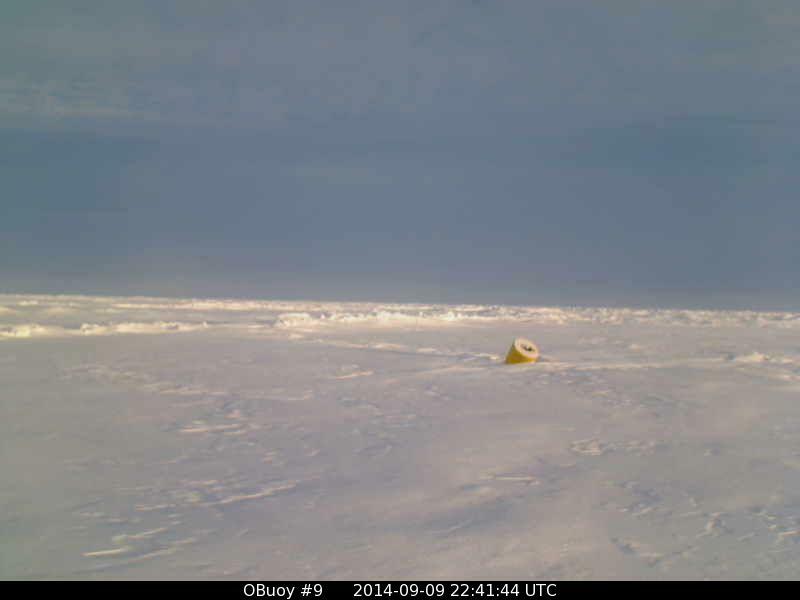 The only buoy moving the right direction was Buoy 2014B: , over on the other side of Being Strait, it it basically stalled. However the fact it didn’t move back east means open water should form between it and the ice that did move east. That open water doesn’t indicate the ice melted. It moved. 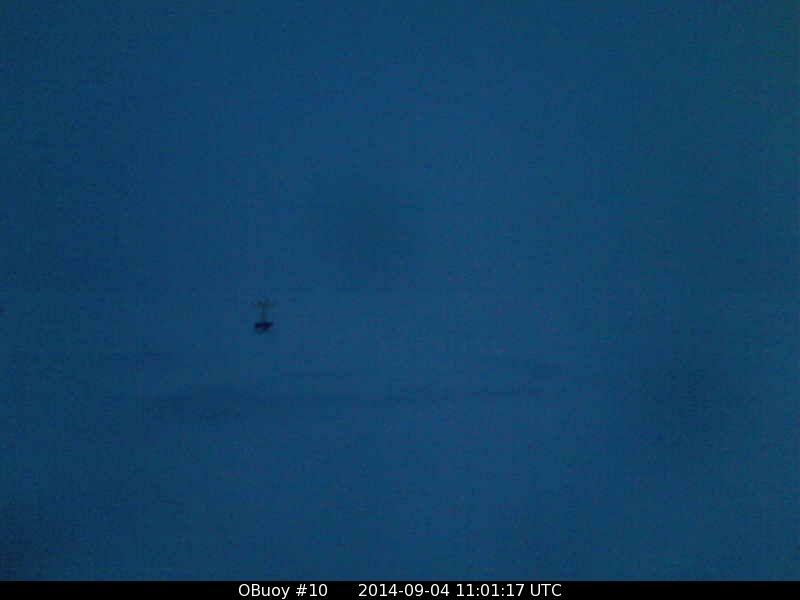 Sure enough, it has gone to the “wrong” side of Svalbard. In any case, the extent is above normal on the east side of Svalbard and below normal on the west side in Fram Strait, and also below normal off the coast of Alaska and in Being Strait. 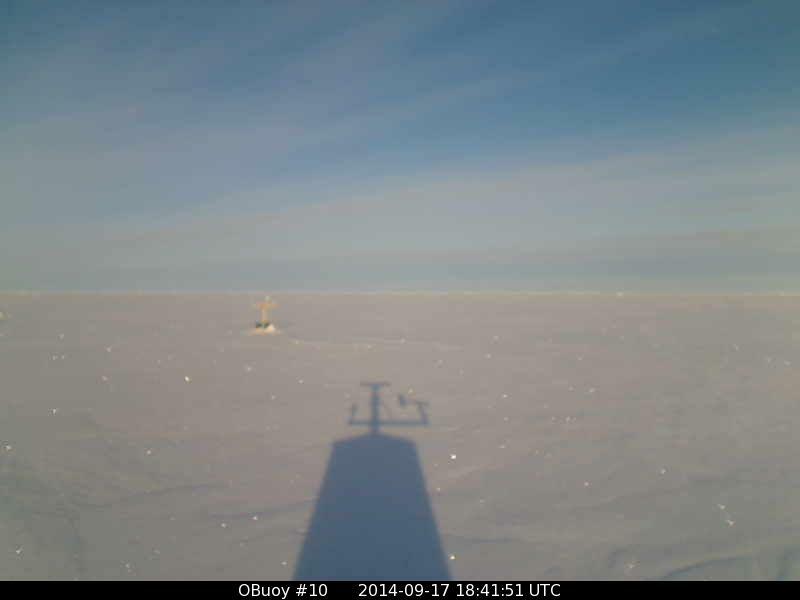 The ice has been very disobedient and made the textbooks look foolish. And that is my lame excuse for botching the “minimum extent” forecast. I am impressed by how solid the ice pack is, where it exists. It is quite different from last year, when it had more open water between the bergs. 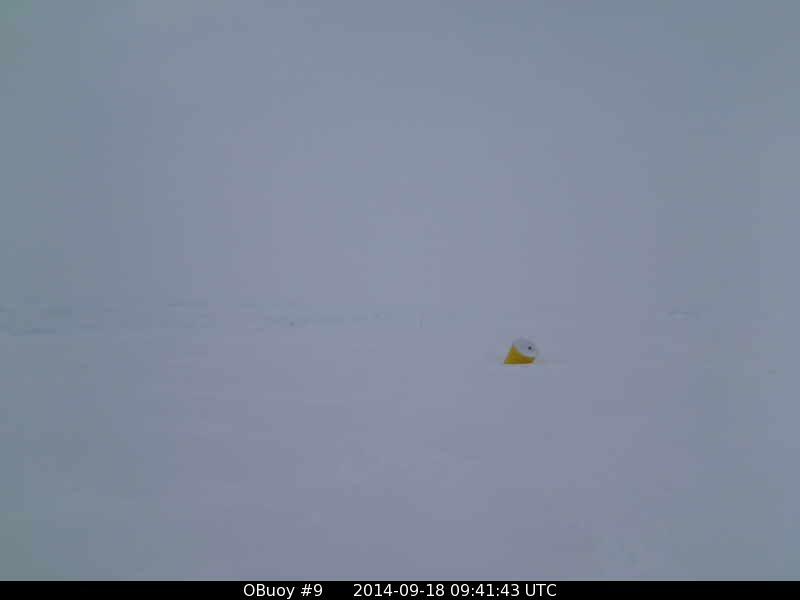 I’ve noticed both these cameras are seeming to sink down into the ice. The southern one used to show yellow around the base, and the northern one looks shorter. In fact it hasn’t thawed enough to sink them (as sometimes happens) and I am fairly sure we are seeing the winter snow-pack start to grow. Our northern camera watches over temperatures steadily at minus seven, as winds pick up slightly to around 8 mph. Our southern camera looks out over a warmer and windier world. After a pause, with winds down to 4 mph last night, they came roaring back to a gale of 30 mph today, though they have since dropped to 20 mph. We flirted with thaw, but only touched it, if we ever broke freezing at all, and conjunct Buoy 2013F: reported -1.09 C at 1200z, and it doesn’t look like we’ve warmed since then. It looks to me as if “Artlesson” is a “warm core” storm, as I see that little pocket of above freezing isotherms between Alaska and the Pole. Like a hurricane, once cut off from the warmth, it will rapidly weaken. Watch to see if cold rapidly builds, especially behind the storm as high pressure builds north of Being Strait. Parade of small storms up the east coast of Greenland and then on to Kara Sea. 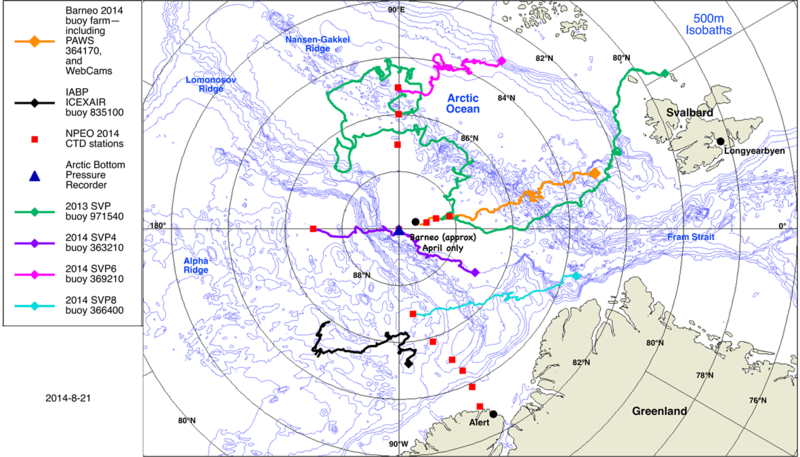 “Na” in Kara Sea, “Nathree” approaching Svalbard, and “Na2” west of Iceland. Our northern camera shows temperatures dropping back towards minus-ten, and winds light, 2-5 mph. 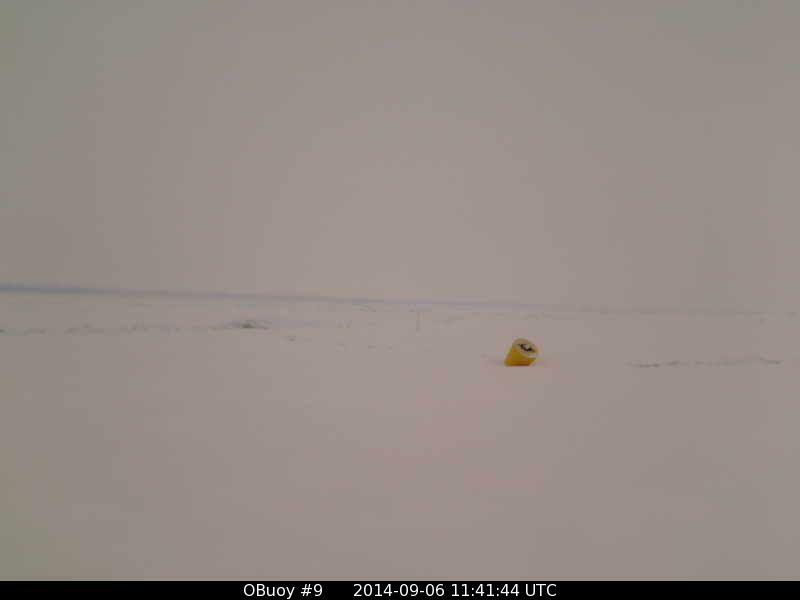 There seems to be more snow atop the buoy. I hope we get a bit of sun as “Artlesson” fills in. 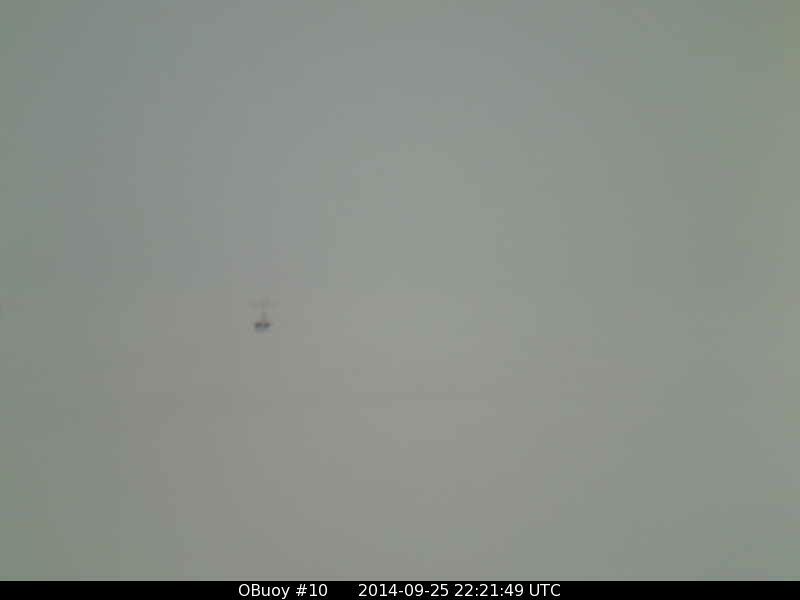 465 miles south towards Svalbard Buoy 2014E: is also cold at 0000z at -4.99 C.
Darkness has descended at out southern camera. I should have grabbed a picture when I first got up. Before the dark fell the camera showed thick ice-fog, which is indicative of dropping temperatures. 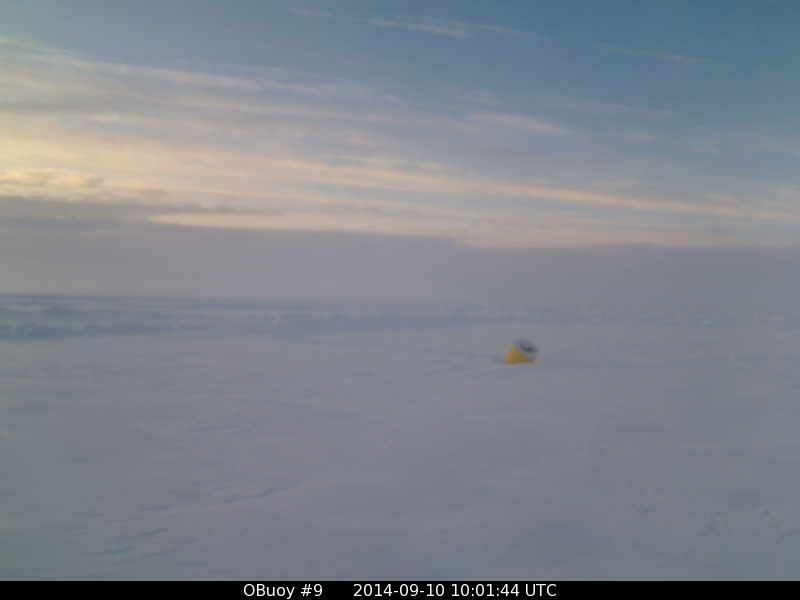 Conjunct Buoy 2013F: agrees, as despite the daylight temperatures dropped from -1.09 C at 1200z yesterday to -2.00 C at 0000z today. Winds have slacked off to 10-15 mph. Perhaps the cold air was pulled south from the Pole by the passage of “Aerlesson”, but the winds haven’t really shifted that much. My hunch is that the cold is home-grown, as the source region still looks to be over towards the west. 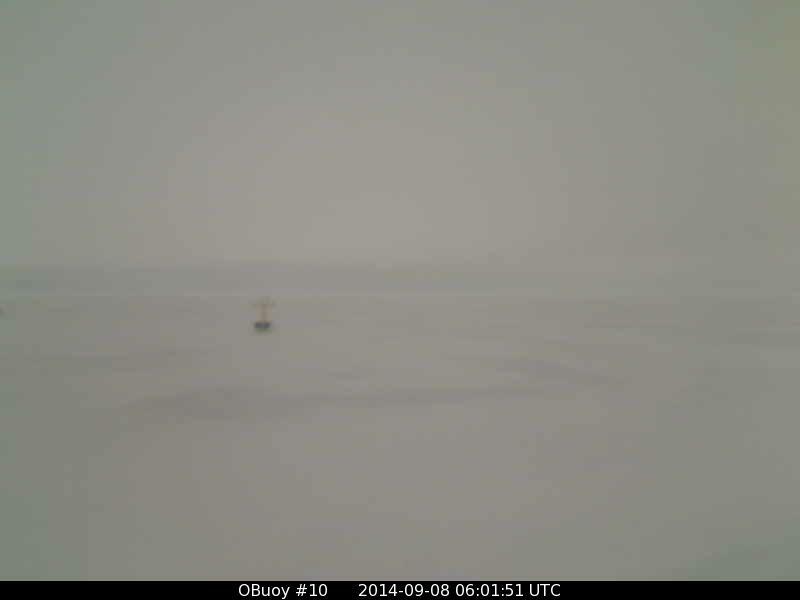 Unfortunately our Wrangle Island Buoy 2014B: stopped reporting temperatures for some reason. I expect the cold to keep building, and the weather to clear. Hopefully our lens isn’t frosted over, or, if it is, the frost sublimates away swiftly. It would be nice to get a last, sunlit look around before winter closes in. An early snow for those folks. “Artlesson” is weakening in northern Canada and cold is building behind it. Cross-polar-flow from Laptev Sea to Canada, much like last winter’s, is occurring during a transitional September pattern and therefor likely nit THE winter pattern. I expect the winter pattern to have the cross-polar-flow displaced more towards Bering Strait, taking the short-cut across the Arctic Sea (with less time spent over the “warming water”) from east Siberia to Alaska’s North Slope, and then right down through the heart of Canada to my back yard. “Nosee” is being squeezed south out of the Baltic as high pressure builds over Scandinavia. 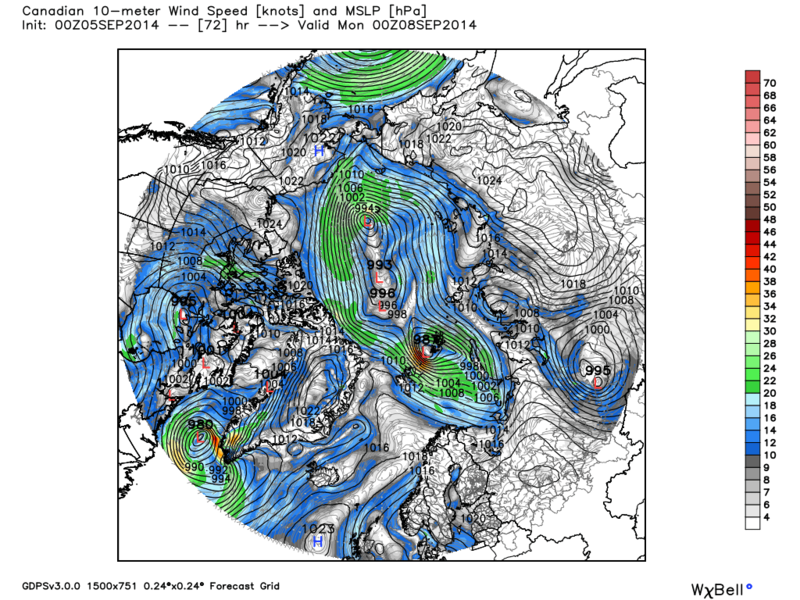 A parade of storms is marching up the east coast of Greenland to Svalbard and then east to the Siberian coast. Could this be the bottom? Too early to tell. 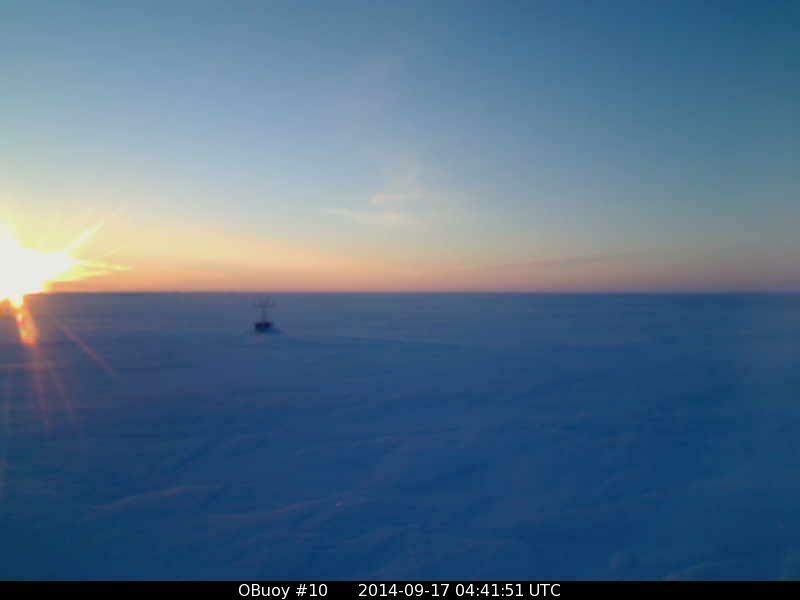 Our northern camera shows sunset starting, as the long arctic night nears. Temperatures have crashed down to minus seventeen! Winds are nearly calm. 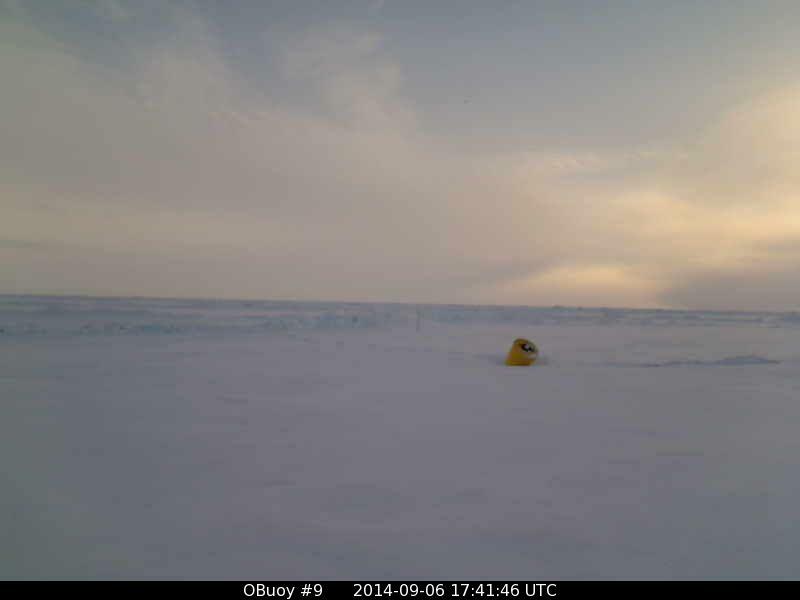 Down towards Svalbard at Buoy 2014E: the cold isn’t as intense, at -6.68 C.
Our southern camera is much further south, where nights have returned. They are still shorter than the days, but not for much longer. Winds have slackened to around 5 mph, and temperatures are steadily below zero. 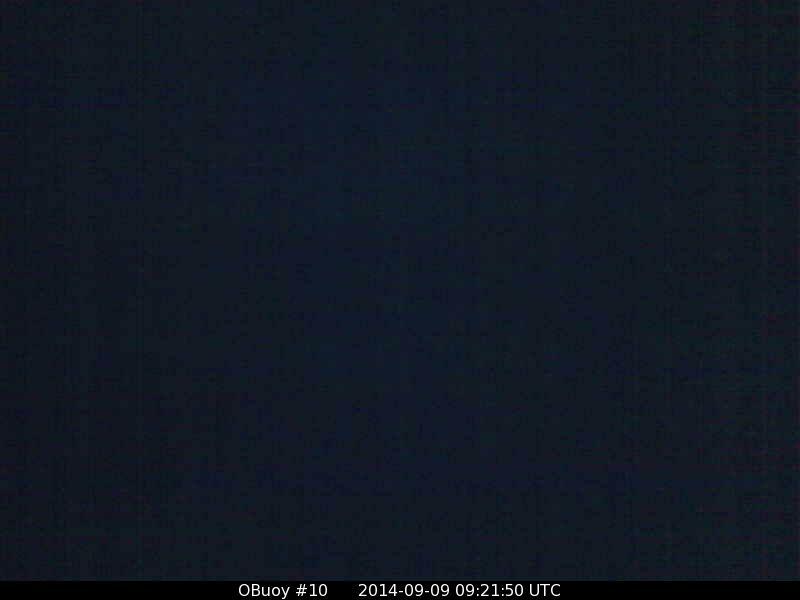 Conjunct Buoy 2013F: was reporting -1.61 C at 0000z. I don’t expect the view to improve much when the sun rises, as I think our lens is obscured. Stewart has my sympathy. I hate storms that destroy trees. We had an ice storm here six years ago that left us without power for ten days, and I well remember the unearthly noise of many boughs snapping in the pitch dark of a neighborhood without electricity. This year I would. There are plenty of anecdotal reports of birds heading south earlier, especially along the Rocky Mountains. The one that caught my attention was from a man who had a hummingbird feeder. He said the hummingbirds had headed south two weeks early. 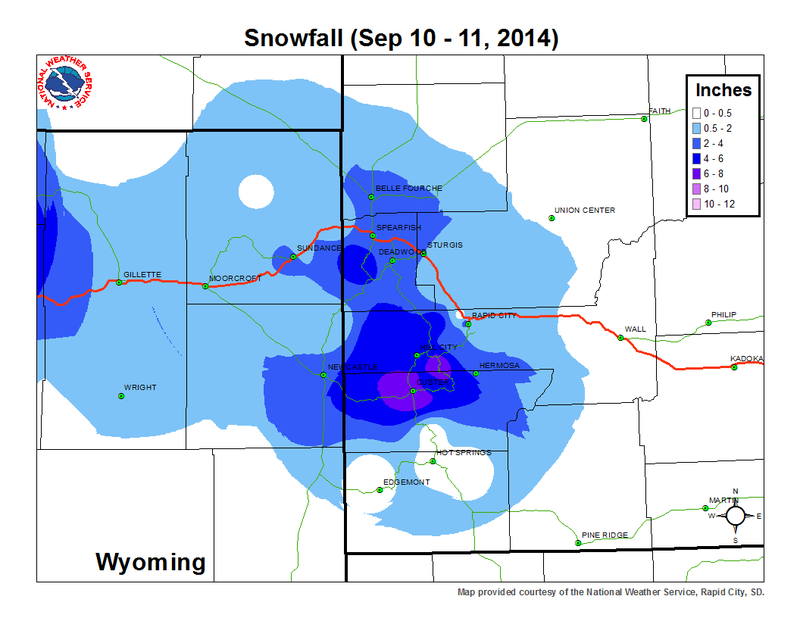 The Rocky Mountain snows may extend down to Denver. “Artlesson” has weakened quite rapidly, and now is merely one of a bunch of lows around Greenland. I call this “A Greenland Daisy,” as there is high pressure over Greenland’s icecap, and the storms circle around like sharks, or petals of a flower, depending on whether you are feeling romantic or not. Also this is a “double-crosser” pattern. with one cross-polar flow from the eastern Laptev Sea to Canada, and a second flow more of a north-Atlantic-crossing-flow, past Iceland and northern Scandinavia to western Siberia. The two flows are joined by a nice, sweeping curve from Hudson Bay around the bottom of Greenland, but the return-flow is more broken up in Eurasia. A nice low was moving up from the steppes to the Laptev Sea, to challange the ownership of the Pole, but a tiny remenant of “Na” snuck in and stole the crown, so that storm will be called “Na.” This has so enraged the people over there that “Na” will flee at top speed across the top of the planet and down the west side of Greenland. After that most of the polar invasions will come up the east side of Greenland for a while. I expect the cold to keep building on top of the earth, as “Artlesson” fills. 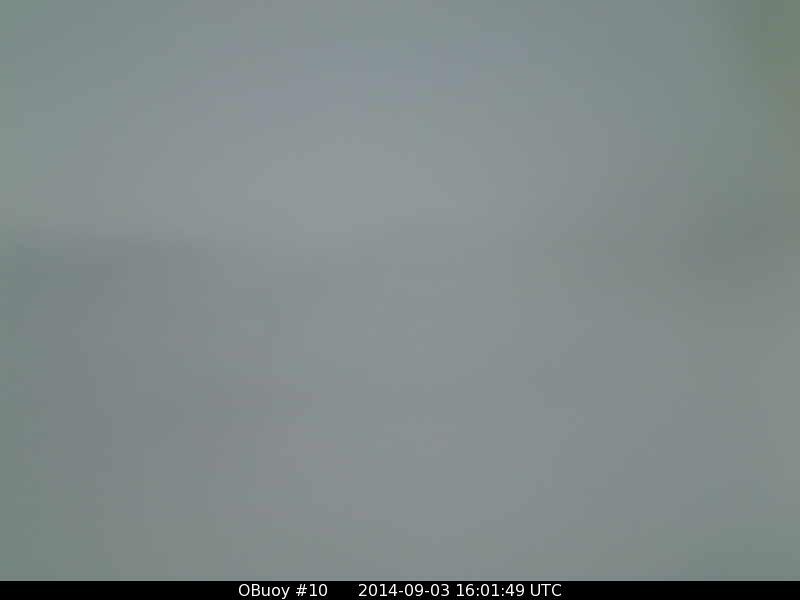 The northern view is gray and a bit misty, though the horizon is visible, which may hint the mist is on the lens. It has warmed ten degrees and is still minus-nine, which gives you an idea how cold it has been. I think the warmth was swung all the way around from Siberia and aling the coast of Canada by the circulation of “Artlesson.” Winds are light, around 5 mph. 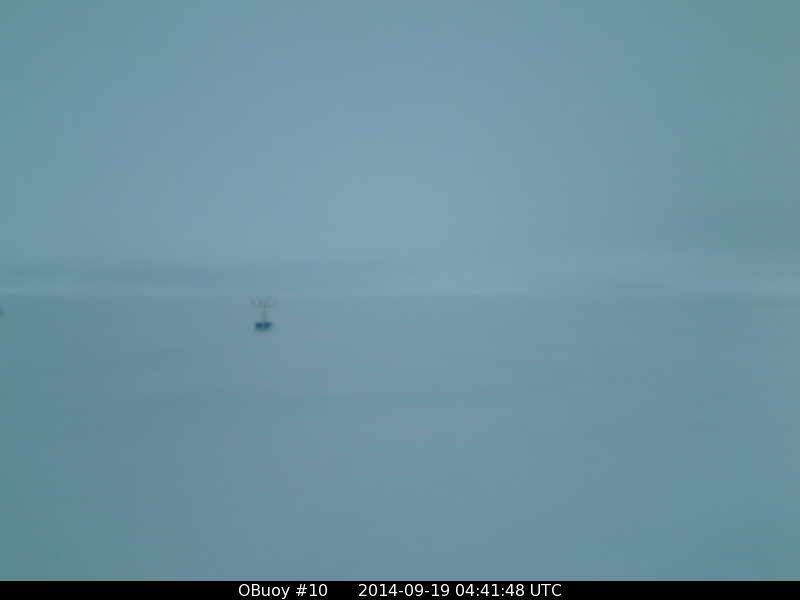 Down at Buoy 2014E , at 0000z tomorrow, it is -5.22 C.
At our southern camera conditions have been very calm, after our recent gales. 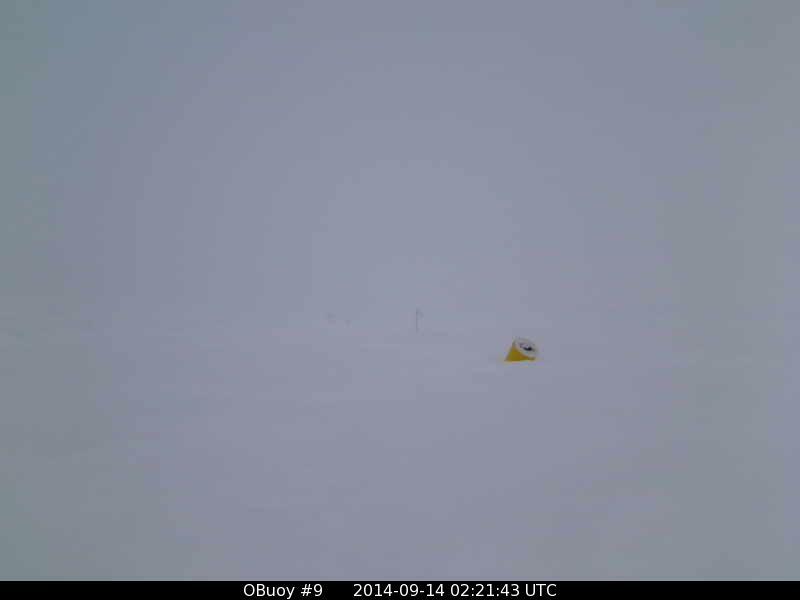 We still can’t see a darn thing through the snow-covered lens. 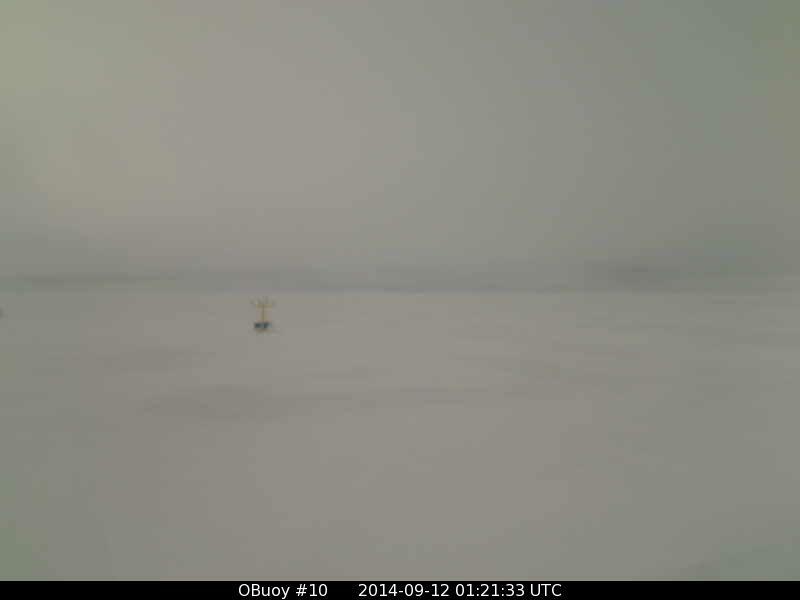 Conjunct Buoy 2013F: is reporting -3.62 C, so temperatures are slowly falling. 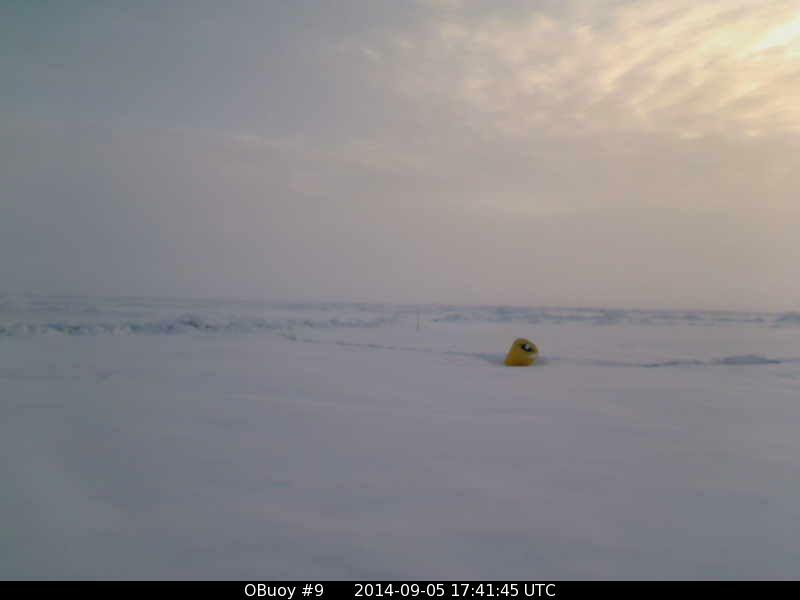 They have got the thermometer on Buoy 2014B: running again, but I think it needs work, as it is reporting -48.03 C. I’d call Hansen to adjust the temperature, but he’s retired. What I notice first on this morning’s maps is the islands made by the minus-ten isotherm north of Greenland. 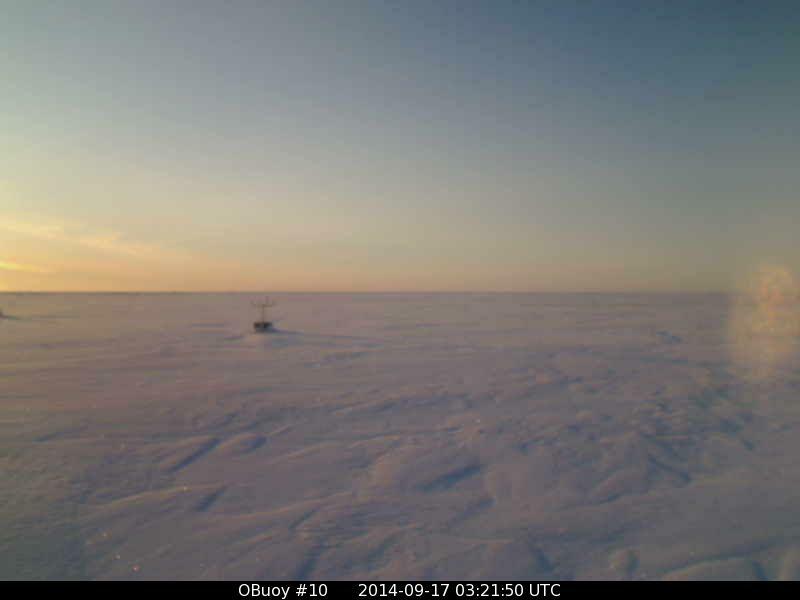 It cools very rapidly at the Pole, even before the sun sets for six solid months. Keep in mind that on September 3 there were no examples of even the minus-five isotherm on our map. The isobars look much like they often did last winter, with a flood of mild air coming from the southwest over western Europe, and a colder cross-polar-flow from the Laptev Sea to the Canadian Archipelago. 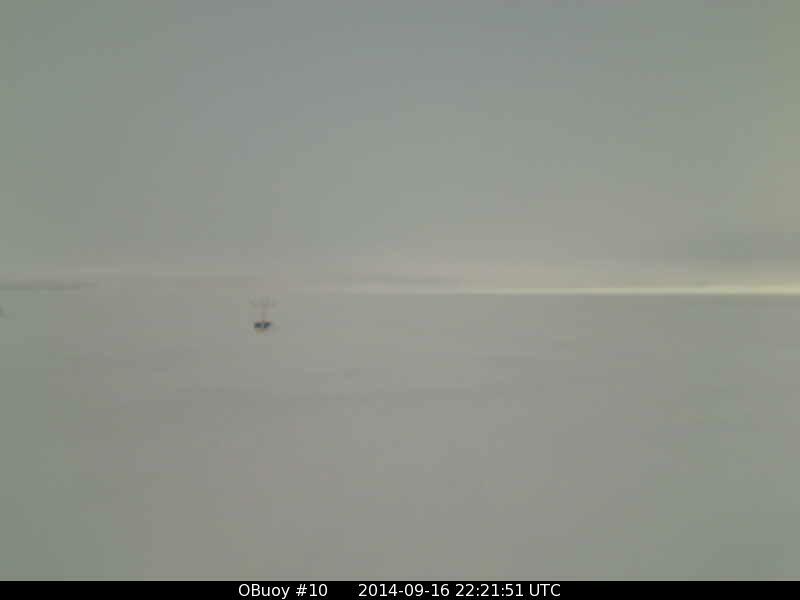 This is why, last spring, the ice was so thickly piled up, north of Canada, and was so thin in the Laptev Sea. All the Laptev Sea’s ice kept being exported, and it constantly had to grow new ice. However keep in mind this pattern we are now seeing is likely transitional, and likely isn’t the winter pattern. 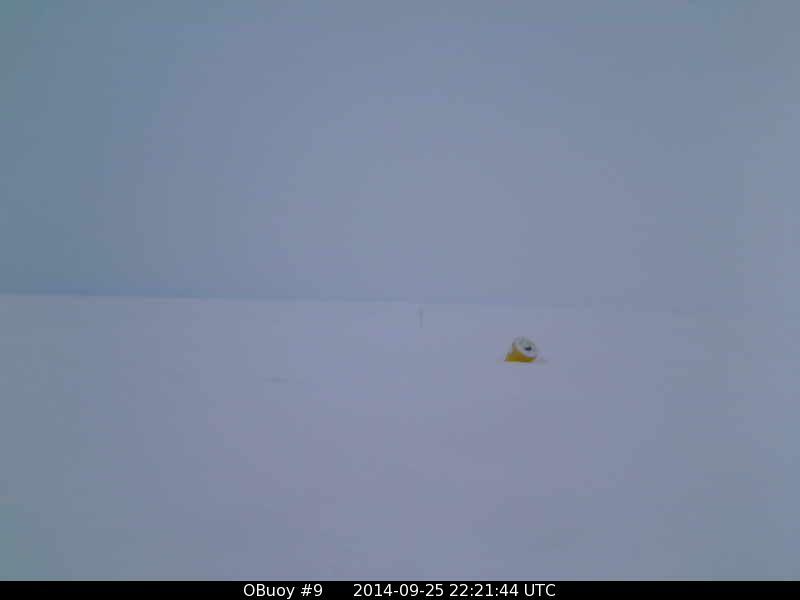 We are nearing the date when our cameras shut down for the winter. It simply gets too dark to see much, even if their batteries need no solar charging. Even before the sun goes down for good, it is harder to melt the frost and snow from lenses, as temperatures rarely get above freezing and the sunlight has less power when it shines onto the lenses. Not that it isn’t possible to get a thaw even after the sun sets. Last winter there were a couple of occasions when the cross-polar-flow set up from Atlantic-to-Pacific, or from Pacific-to-Atlantic, and these flows brought spears of maritime air north. The air cooled very swiftly, and didn’t quite thaw the Pole itself, but would have thawed cameras south of the Pole, had they still been operating. You could continue to follow these spears of milder air all the way across to Pole and to the far ocean, though by the time they reached the far ocean they had cooled to a point they were well below zero. What a person on the far side would have noticed was that the north wind was less cruel, minus-fifteen rather than minus-forty. Our northern camera sees temperatures continue to creep upwards, and the lens is likely obscured by moisture swept all the way around from the Siberian side of Bering Strait. Winds remain light. 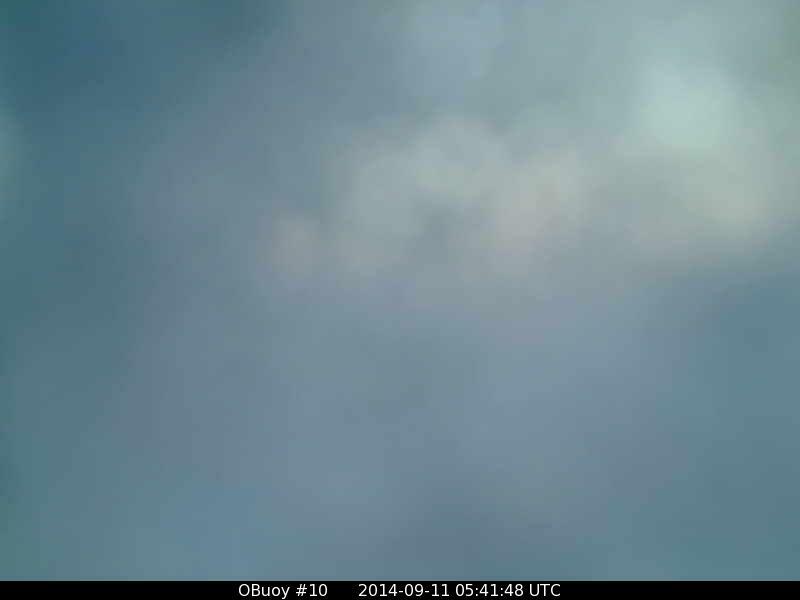 The sun should swing around and strike our lens later today, and hopefully we’ll get a better view. Insomnia got me out of bed, and I grabbed a copy of the southern camera’s view before darkness fell. It gives me hope the lens may be sublimating the frost and snow away, and we might get a last look around, with this camera, as well. Temperatures continue to fall, and winds remain light. Two way street. Storms heading east up the coast of Greenland and across north of Norway, and other traffic coming across the Pole from Laptev Sea to Canada. I have to run to a meeting. Hope to comment later. The “two lane highway” persists, with cross-Atlantic-flow at the bottom and cross-polar-flow towards the top. The cross-polar-flow has drawn some milder air north from Siberia, but Siberia is running out of mild air. The cross-Atlantic flow has swung some cold aor down into central Siberia, especially southeast of the Kara Sea, and temperatures are below freezing inland. If that cold air creates snow-cover, the south winds will cease to be warm. At the moment the Pole is basically divided in two: The upper, Pacific side of these maps is a zero or slightly below, while the bottom, Atlantic side is very cold. There have been two exit regions, one into central Canada and one into central Siberia, and those inland regions are now gathering their wolves of winter. “Na” fled across the Pole to join a disorginized area of low pressure west and northwest of Greenland, and a weak Nason is following out of the Laptev Sea as part of the cross-polar-flow. Meanwhile “Na2” has rode the cross-Atlantic-flow over the top of Europe, and is now diving towards the Kara Sea. “Na3” is orginizing and coming up Greenland’s east coast. These storms coming up Greenland’s coast mean business, and will be the bosses next week. The Chicago and Northwestern Railway was being built across South Dakota, and the town of De Smet was established, but nearby farms had not been developed to a degree where the town was self reliant. It was totally dependent on the railway. Because that winter was so hard, with blizzards lasting 2-3 days, one after another, with only a day or two between each blizzard, the trains stopped running. The cuttings the train tracks passed through were packed with snow up to their brims. The people in town were without fuel for their stoves or food. They burned hay, subsisted on potatoes and coarse grain, and a few slaughtered their livestock, but the situation was very serious when two local youths rode 12 miles across the windswept waste to obtain sixty bushels of wheat from a distant farm, and made it back just as the next blizzard hit. This historical reality is described in the book, “The Long Winter“, by Laura Ingalls Wilder. It is a children’s book, but I can think of a few at the EPA who should read it, before insisting coal power plants be closed this January. This may very well be a very bad winter. If the EPA closes power plants, well aware people may die, and people do die, it is not a miscalculation; it is murder. The sane and humane thing to do is wait until April to close those power plants. By the way, in 1880 the first blizzard hit in October. I’ve been out of town, and the situation changed as soon as I took my eyes off of it. Again wer have strong high pressure over Scandinavia and weaker high pressure over the Beaufort Gyre. The cross-polar-flow is temporarily gone, at the surface, though it may exist aloft, as it looks like “Na2” may swing up into the Laptev Sea and then attempt a polar crossing. Meanwhile “Na3” has come up the East Greenland coast and looks impressive, but will flatten like a ripe tomato hitting a brick wall when it hits the cold air, and bleed east to the Kara Sea, even as “Na4”, now at Cape Farewell on the southern tip of Greenland, follows “Na3” and becomes impressive. Eventually these Atlantic storms will push the high pressure off Scandinavia, but for the time being that Scandinavian high pressure is steering storms north and bringing milder air up to attempt entering the Barents Sea. The above maps show “Na3” flattening against the wall of cold at the Pole and being squeezed eastto the Kara Sea. It did manage to bring some mildness north, however the mildness is largely being shunted east along with the storm and then back south towards Siberia. 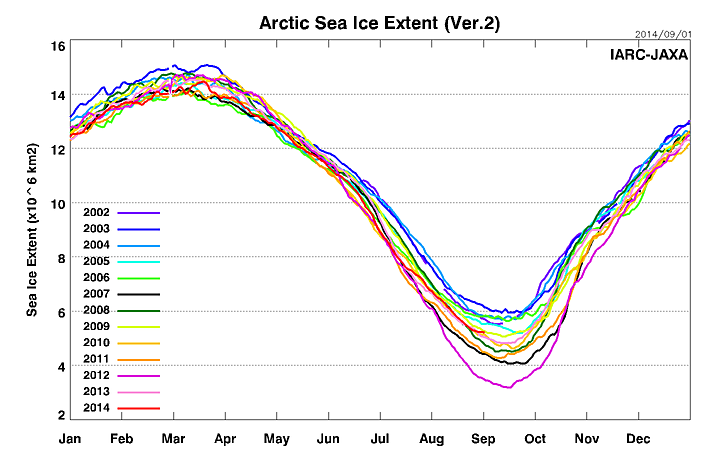 However the storm did shove the sea-ice north, rather than spreading it out, and reduced the “extent” graph. Cold is building north of Canada, and new sea-ice is forming in the Northwest Passage, and also the Chukchi Sea, countering the reduced “extent” on the Eurasian side. “Na4” is getting its act together off the southeast coast of Greenland, prior to coming up the coast to attempt to bash into the wall of cold. As long as the high pressure remains strong over Scandinavia the storms will come north towards Greenland, and their cold fronts will be weak and will not penetrate far down into Scandinavia. The intial map shows the strong high over Scandinavia, “Na4” growing between Greenland and Iceland, and “Zorro” still spinning its wheels to the west of Spain, where it has been stalled for a week. The second map is the guess at conditions for 1200z Wednesday, with the high pressure barely being budged west in Scandinavia, “Zorro” still stalled, but “Na4” now to the northeast of Greenland and stronger. Of interest is Hurricane Edouard just appearing at the bottom left corner. Even though it is officially still summer, this map shows the first snow cover appearing on the north slopes of Alaska, and also in central Siberia. This requires a quick mental adjustment. Due to the sun getting low, and the nights swiftly growing longer and soon to be longer than the days, radiational cooling will make the air over the tundra colder than the air over the open, coastal waters of the Arctic Sea. The south winds go from being warm at the start of September to being cold at the end. We still have to wait and see how much bashing and crashing “Na4” does to the sea-ice, as it comes north in the middle of the week, however it will be hard for the storm to push the ice much further north, as the ice is quite tightly packed to begin with. Also a thin glaze of new ice is forming all around the edges of the arctic, where ever conditions are calm, because the cold is building very quickly. It becomes hard for storms to tear apart the ice faster than it is forming. 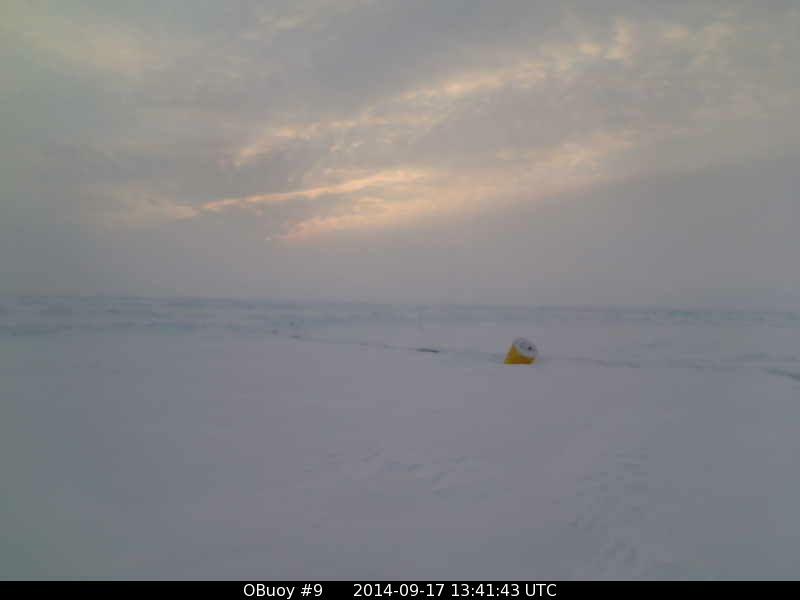 I should note that the remaining sea-ice is noticeably denser than it was last year. It doesn’t show up in an “extent graph” which gives areas that are only 15% ice (and therefore 85% open water) the same weight as areas that are 90% ice. 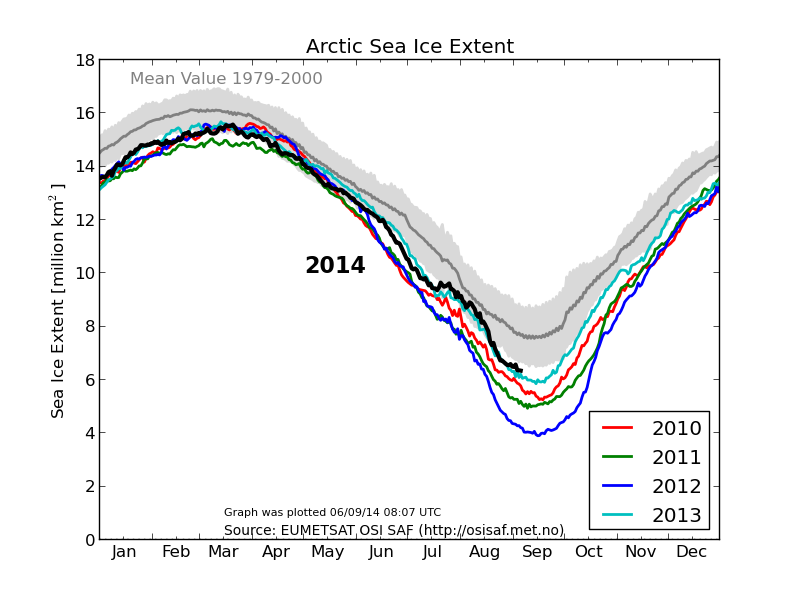 It doesn’t even show up in the old DMI graph that only measures ice extents above 30%. 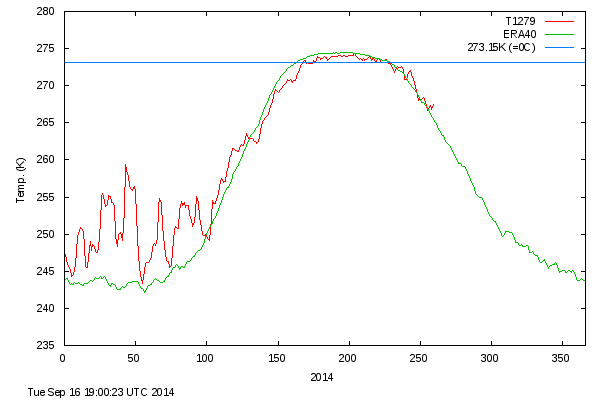 However if a graph existed that only measured ice extent above 60%, I think this year would be far ahead of last year. 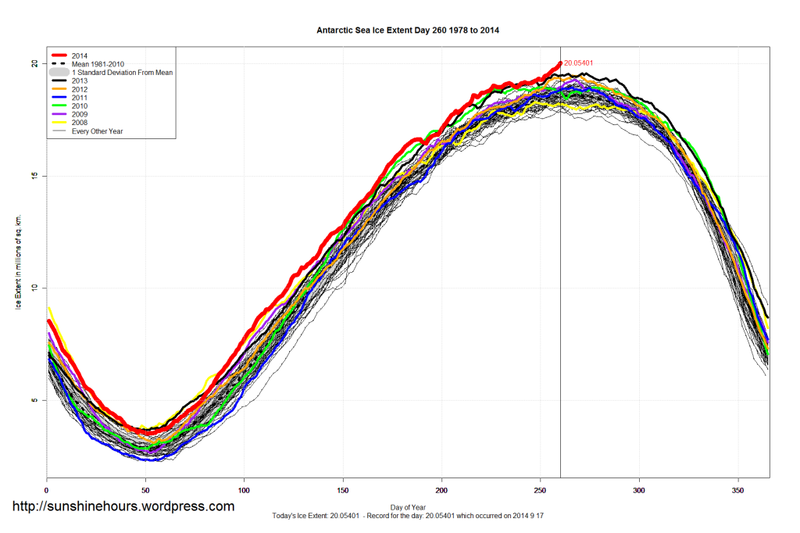 Actually there should be a decrease in ice, considering both the AMO and PDO are currently in “warm” phases. If the PDO doesn’t swing back to its “cold” phase by next summer (as it should) I would expect the extent to be less next summer. However this decrease, if it happened, would only show the ice responds to oceanic cycles. It has next to nothing to do with CO2. The reason these west-coast hurricanes make me nervous is that the suggest the pattern we are in may be like the pattern that preceded the winter of 1976-1977, which was particularly cold, in New England. A lot is going on in the above maps, and a change is in the air. Where “Na3” got flattened like a tomato hitting a brick wall, and was shunted swiftly east to the area inland of the Laptev Sea, “Na4” looks far more solid. You can see a nice inflow of mild air bringing the plus-five isotherm up to Svalbard, and the freezing line well north of there. “Na4” will feed off that mildness and also minus-five air, and behave as if he will take the Pole and shunt the entire Beaufort high pressure into North America. 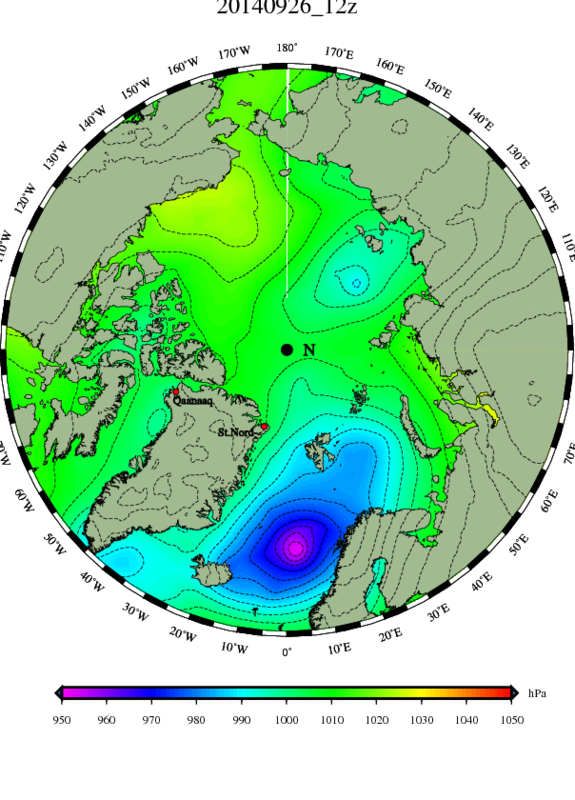 However that high pressure will recover and strengthen, pushing Na4 down towards Barents Sea, and dislodging the high pressure that is sitting over Scandinavia. As this high pressure, (call it “Lars”, for the “lar” in “polar”), grows to over 1030 mb over the Pole it will shift the Atlantic storm track south towards Scandinavia. As “Lars” moves towards the Pole and beyond models are showing an unusual invasion of a Pacific storm, moving up from southeast Alaska, through Canada to the coast of the Canadian Archipelago. Hmm. That is so unusual one wonders if the models are short-circuiting. To the other side of “Lars” you can see a cross-polar flow I call “the short cut.” It crosses from Siberia to Alaska north of Bering Strait. It isn’t cold yet in eastern Siberia, but I fear this flow later in the winter. It brings the coldest Siberian are over the least amount of sea-ice, and the air can remain very cold during the passage. Last winter’s air was warmed thirty to forty degrees as it crossed from the Laptev Sea to the Canadian Archipelago, sometimes departing Asia at minus-seventy and arriving in Canada at minus-thirty. (It cooled the Arctic Sea a lot.) The short cut cools the ocean less, but during the winter of 1976-1977 it brought minus-thirty as far south as Cincinnati, Ohio, and there was sea-ice in the harbors of Virginia. I was hot-blooded back then, but now I have no desire to see a winter that nasty. 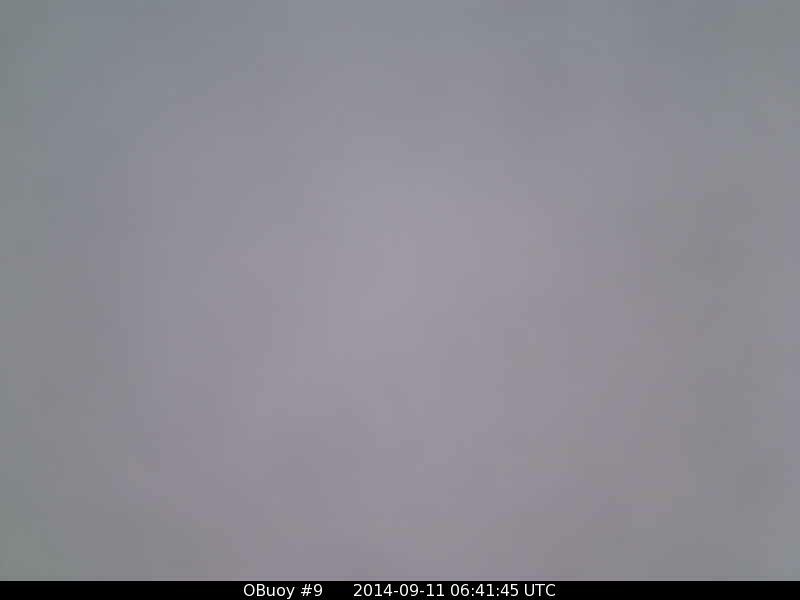 The view from the northern camera has been dull, gray and uninteresting for days. 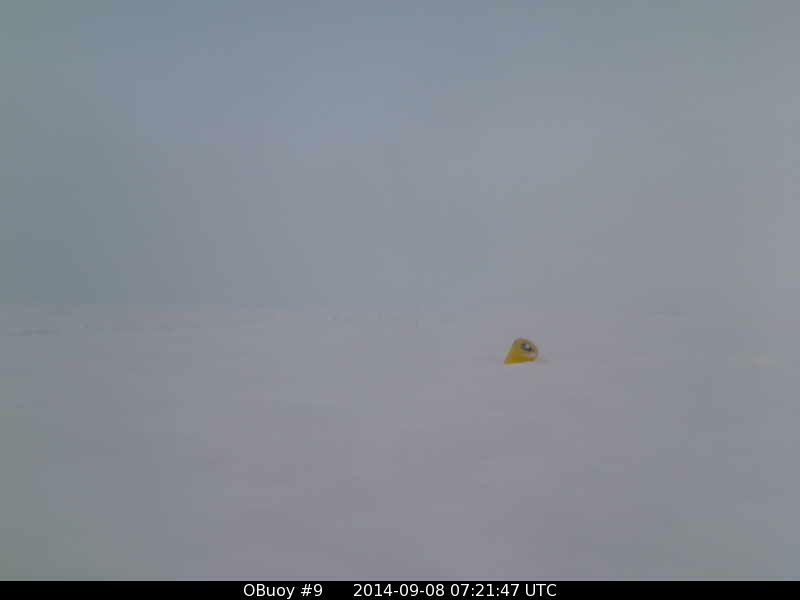 Winds did get up to 20 mph on Saturday, which causes the crack just beyond the buoy to shift enough to disturb the fresh snow, but I doubt we’ll see the lead reopen like it did last August. It could happen, even in the dead of winter, but it is less likely when temperatures are below the freezing point of salt water, as they’ve been for over a week. They’ve had to struggle to even approach minus-five, and currently are diving back down. Winds are calm, and the ice itself is being compressed towards Canada rather than spreading out towards Eurasia. I suppose “Na4” might give us another blast of wind, especially if “Lars” builds against it. 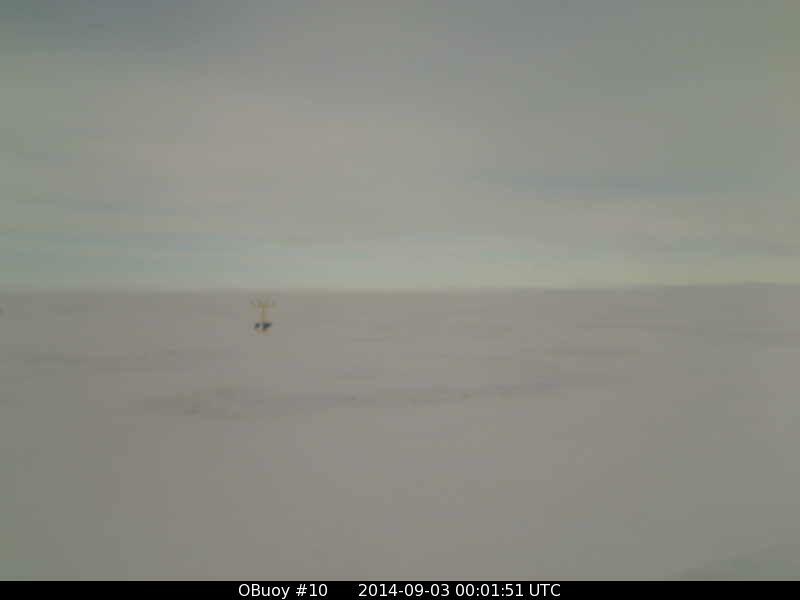 It got nearly up to freezing at Buoy 2014E: at 1200z today, +0.09 C at 1200z, (though it has slipped back to -0.77 C at 0000z, as it is tomorrow there already). However I doubt we’ll see thawing or a lead, and if there is to be action in strong east winds, it might be the building up the pressure ridge we’ve watched slump and shrink all summer. 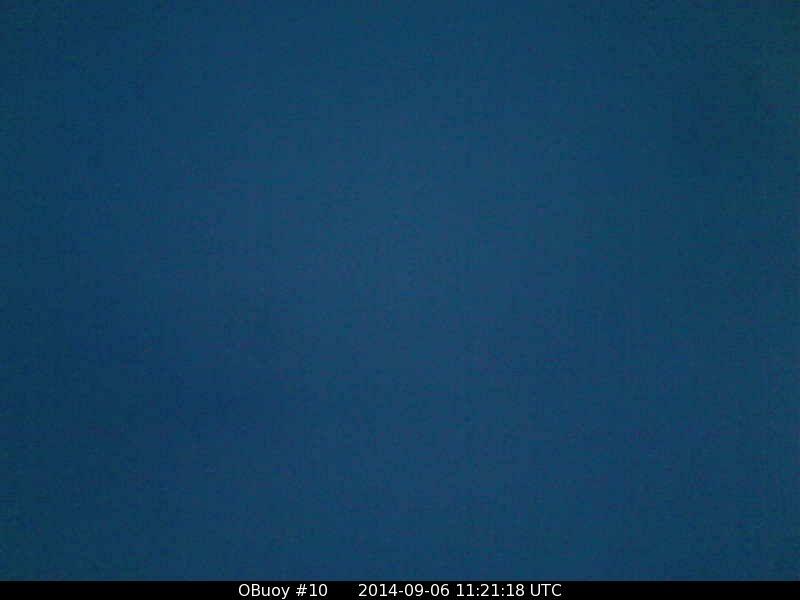 Our southern view hasn’t been much better, as frost often has obstructed the lens. It hasn’t seen temperatures above the freezing point of salt water in three days, and at 1200z today conjunct Buoy 2013F: was reporting a cold -8.63 C. Also this ice has also been compressed north, rather than dispersing towards the open water to the south. 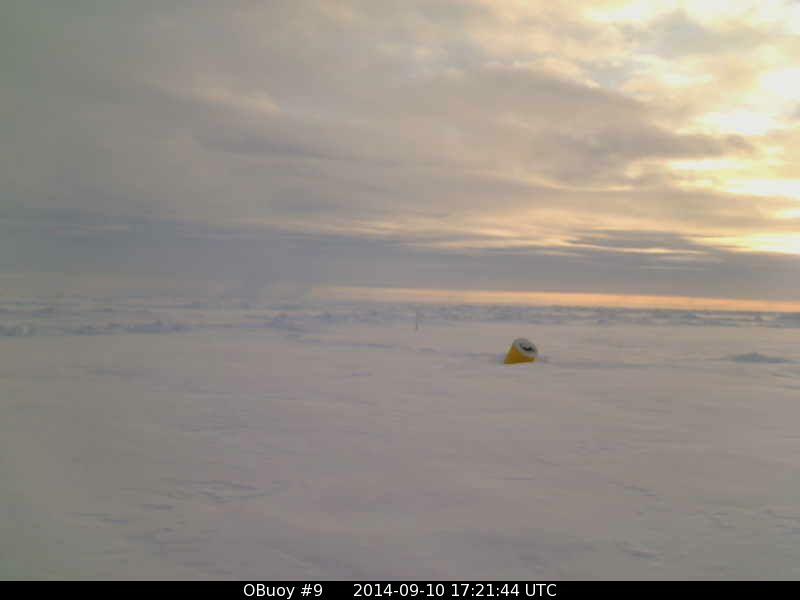 Even down that way, towards the open water, Buoy 2014C: is reporting -2.09 C at 1200z, (and falling to -2.31 C ao 0000z “tomorrow”, despite the sun being up). To the east Buoy 2014F: -8.88 C (and -6.67 C “tomorrow”), while further east the old, veteran Buoy 2012G: was reporting a bitter -12.35 C (and 8.11 C “tomorrow”). With cold like that around, you can understand why newly formed ice is reported on open water in the Northwest Passage, and even out in the Chukchi Sea. Since that post was published at around 11:00 AM on September 13, the ice has gone right on increasing in the stormy seas around the South Pole. I figured the post needed an update, but was frustrated when I tried to find an updated graph. I can’t tell you how often this happens. I am frustrated when I try to locate something that might illustrate a topic that is breaking news, and when I visit their site I discover they are way ahead of me. For example, I’ve been talking about how worried I am the coming winter might be like 1976-1977, due to various signs. One is hurricanes coming up the west coast of Mexico. 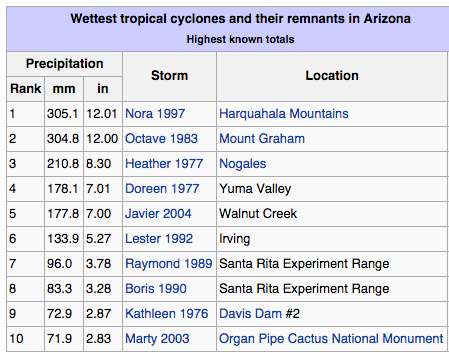 When I visit Joe Bastardi’s site I discover this graphic, illustrating the heavy rains of Kathleen in 1976. 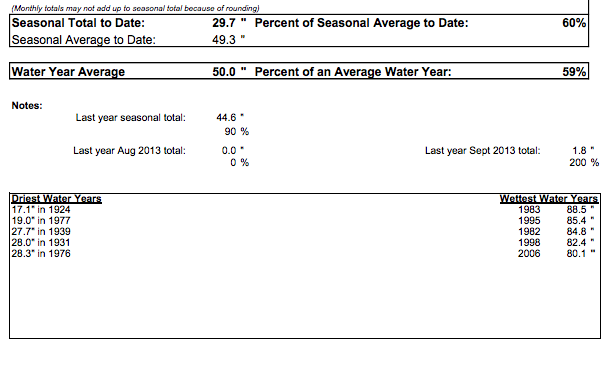 This shows that the fifth driest year was 1976, a little drier than this dry year. This is just another hint I may be going to suffer hardship this winter. It seems to me a description of how bumpkins in the country survive such hardship, when their idiotic government is shutting down coal-fired power plants when they are most needed, will be more interesting to read about than the North Pole, when it is too dark to see up there. For this reason I may be cutting back on my posting about the Pole. I feel a little bad about it, as I have a small number of faithful readers who don’t want me to cut back. I’ll try to post once a week about the Pole, out of gratitude for their kindness and attention, but it really does get a bit boring up there, between the time the sun sets and the time it rises. Readers visit much less often, and my attempts to keep the faithful entertained last winter got a bit silly. Looking back at those posts, I can see the posts were not so much about me visiting the Pole, as they were about the Pole visiting me. People who were interested in the Pole had to wade through a lot of chaff about New Hampshire to glean a grain about the Pole. This year I’ll compartmentalize. The Polar posts will be separate from the local yokel stuff. I imagine the local yokel ramblings of a bumpkin will be daily, while the Polar Posts will be weekly. If anyone feels deprived, I urge them to subscribe to Weatherbell. On a daily basis Joseph D’Aleo and Joe Bastardi publish more fascinating ideas than I can manage in a fortnight. Also Ryan Maui offers an amazing collection of thousands of maps and charts, on a daily basis. You can get a week-long free trial, and see for yourself. “Na4” is whirling northwest of Svalbard as the high pressure “Lars” starts to strengthen over the Beaufort Gyre. Beyond that the models have done some amazing switching around since last night. No longer do they see “Na4” shunted southeast, strengthening and becoming a gale in Barents Sea. Instead it stays strong, and when it is eventually shunted southeast is dwindles away, and a formerly unseen low, (a “Na5” that weakly crosses the Atlantic on a much more southerly route,) comes up from the south through the Baltic to a point east of Finland. Scandinavia still gets its change in the weather, but more from the northeast, rather than so much from the northwest. A weak low is running along the arctic coast of Alaska into Canada. The odd Pacific storm that last night’s models saw coming up from the southwest has mysteriously evaporated from the forecasts. Shucks. I thought that might be interesting to witness. I’m relishing the decent spell of picture-taking we are getting. The northern camera shows a calm and very cold scene, though not as gold as it got last night Our graph shows that it plunged to around -17, before bouncing back to around -7, and now sinking back to around -8. Surprisingly the wind is nearly dead calm, despite “Na4” brewing up on one side and “Lars” strenthening on the other. I hope the skies clear a bit more, and the low sun gives us enough light to study the pressure ridges in the distance. I think they may be rebuilding. The southern camera shows the ebbing light of summer, as the twilight never quite fades even as the nights lengthen. 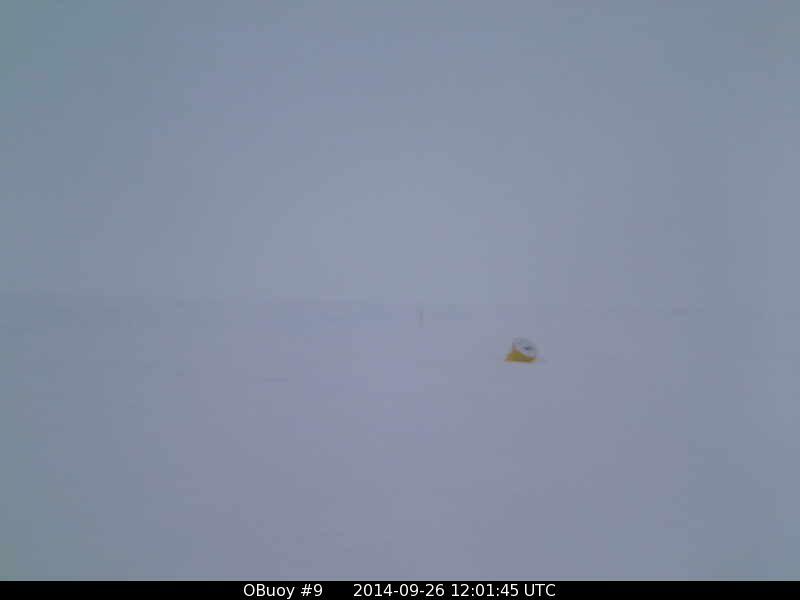 Though it doesn’t show on the DMI temperature map, temperatures have been steadily sinking, and are below minus ten. 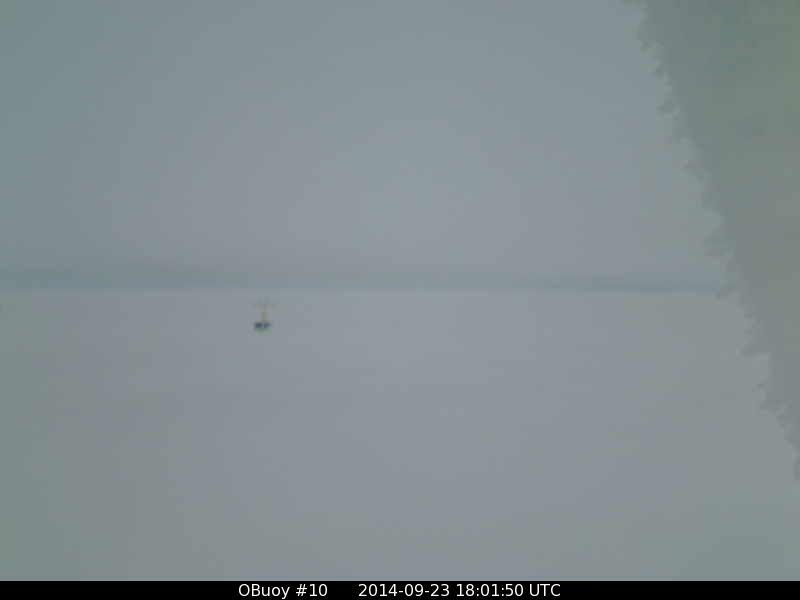 Conjunct Buoy 2013F: was reporting -11.44 C at 1200z. 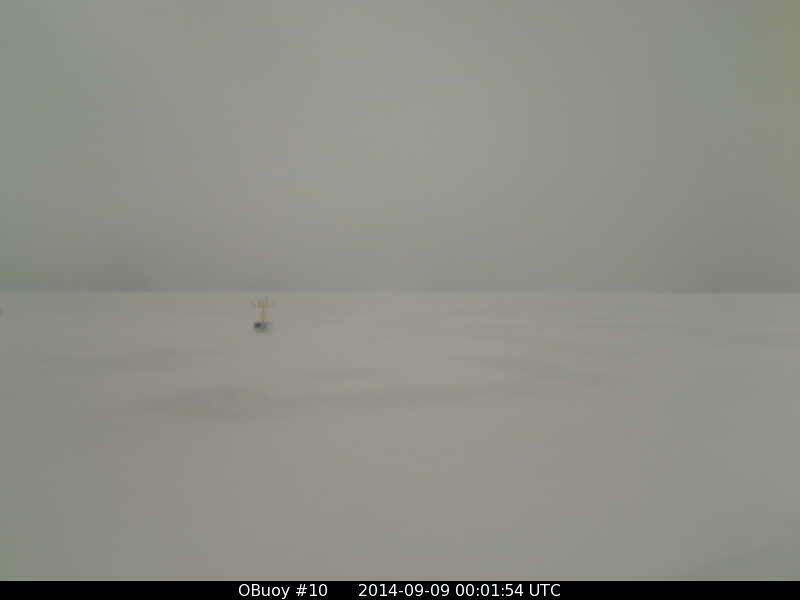 Any nearby open water will be skimming over with new ice. Nor is it the shallow cold of a calm, as winds have picked up to a light breeze of 8 mph. Due to the wall across the top of the Atlantic, “Na5” will not run up the east coast of Greenland, but will move straight east across the Atlantic as a weak low, and drift across Scandinavia this weekend, as the high pressure over Scandinavia fades southeast. Some models show “Na5” becoming strong over Finland early next week. Before that happens “Na5” will merely be part of a long area of weak low pressure extending east along the Siberian coast, from “Na5” through “Na4” and “Sha” to the faint remains of “Na3” in the East Diberian Sea. North of this low pressure will be a long fetch of east winds between the lows and “Lars”, which will elongate and deliver cold air towards the North Atlantic and Scandinavia. In essence we will have seen the flow completely reverse in five days. Sorry I’ve commented so little today. 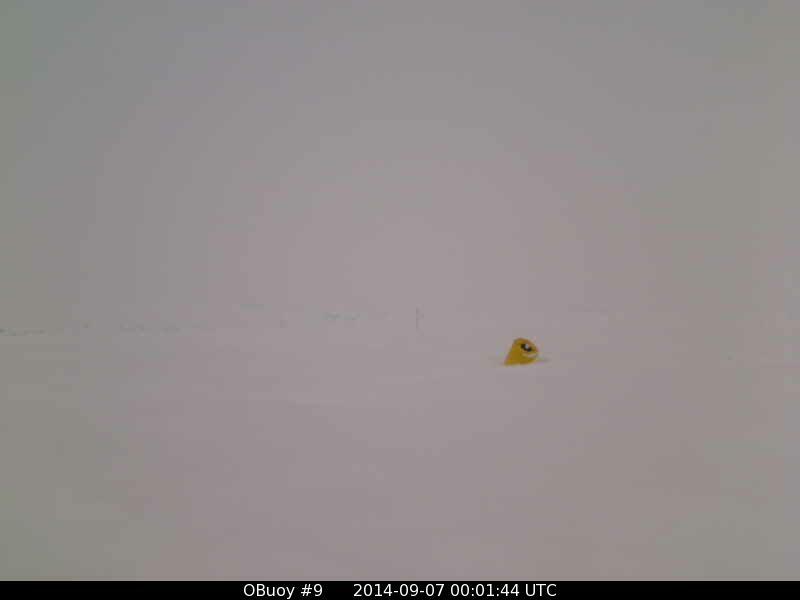 I’ve been busy on the the far side of the planet, where Antarctic sea-ice is setting a modern record. 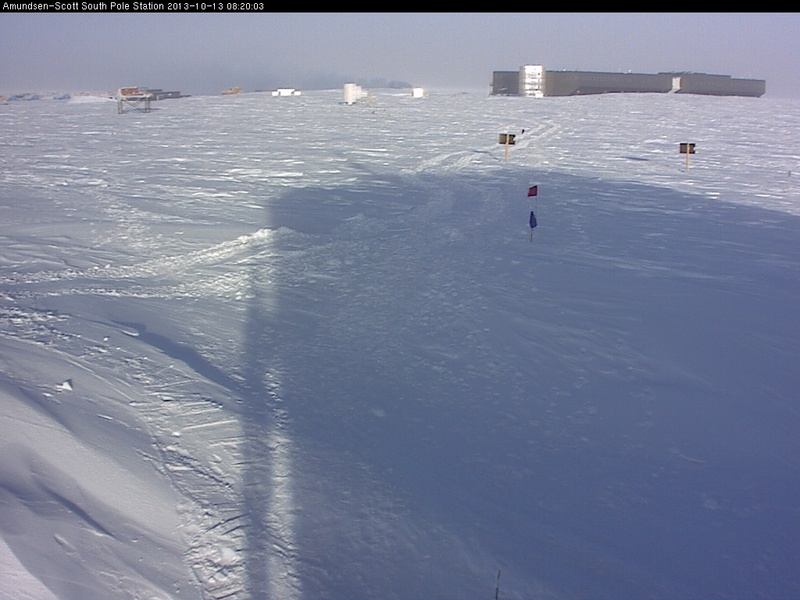 Even as the sun goes down in the lenses of our faithful cameras to the north, their long night is giving way to predawn twilight, and north of the South Pole at the American base, actual daylight startles the scene. I apologize for commenting so little, though at times silence seems golden. I like looking at the sequence of maps above, without a bunch of words cluttering things up. You can observe more if you conclude less. The high pressure “Lars” has strengthened over the Pole as “Na4” faded and weakened. As long as Lars is in control, there wont be much export from the Pole, and fall will not be as cold in many places. However the Pole itself, which was greatly warmed by the slug of southern air “Na4” brought north, is likely to see temperatures crash. Currently they are well above normal. The above graph should now spring upwards, however there is a final chance to reduce extent, depending on how things develop. As “Sha” absorbs “Na4”, it may bring a pulse of warmth north into the Kara Sea, and this pulse may become a surge if the meek and hardly noticable “Na5”, after creeping across the Atlantic and creeping across Scandinavia, explodes into a gale east of Finland. “Lars” is now a high pressure king of the Pole, with a solid-seeming ridge of high pressure extending south down the spine of the North Atlantic. However don’t blink, for things change swiftly during this time of transition we call the “equinox.” A couple days ago “Na4” seemed in control of the Pole, and where is it now? Absorbed into “Sha”, which barely touches the south coast of the Laptev Sea. In the same manner “Lars” will be difficult to find in a few days, as is slides and slips down to central Siberia, and is well inland. Models are not at their best, when things are altering so swiftly, but it still looks like a storm will brew up to the east of Finland. Now it looks like some part of “Na5” will brew up in the Baltic and move northeast. “Na6” is now smashing into southern Greenland, and a peculiar thing models are showing is a small northern part sliding up Baffin Bay and right across the Pole, as the rest becomes an autumnal North Atlantic gale charging across the Atlantic to Scandinavia. Much to see, this coming week. It is amazing how swiftly these maps went from looking like a zonal flow to what appears to be a meridianal flow. I’d like to ponder it more, but not as much as I’d like to see my wife smile on our wedding anniversary. So….man-yana. It is difficult to talk of a “storm track” when no two storms behave the same. About the only similarity is that, one way or another, low pressure systems keep making it up to the Pole. A truly zonal pattern would have a high pressure dominating the Pole, w3ith lows waltzing around it. Na6 has crashed through Greenland, and become a northern (“Na6N”) and southern (“Na6S”) duo. 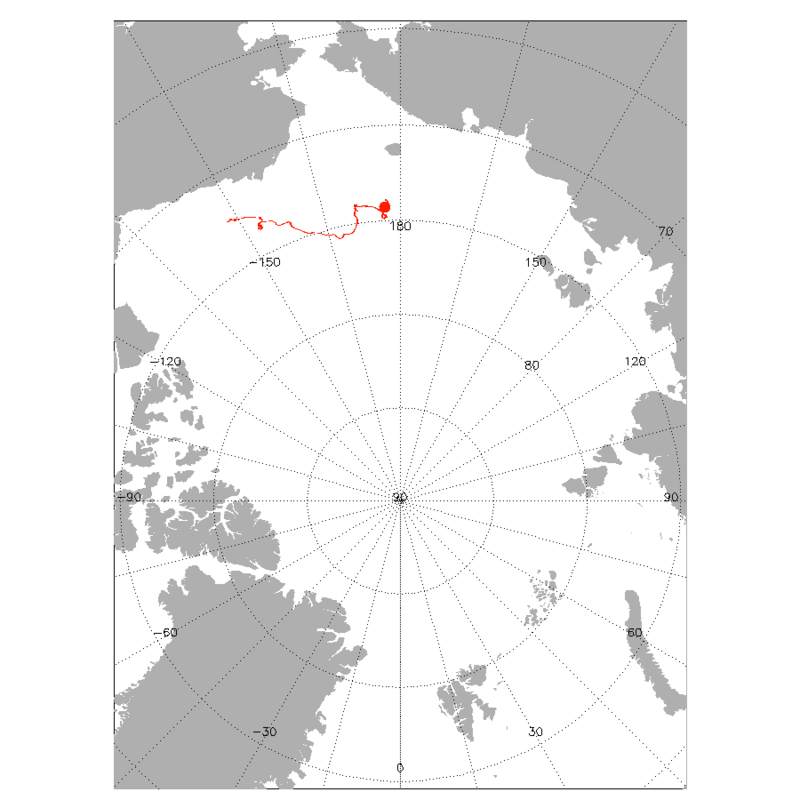 The northern Na6N will cross the Pole and wander down to to the Laptev Sea, completely opposite the storm that crossed they other way a couple weeks ago. Meanwhile Na6S will not come up the east coast of Greenland as storms have done, but will penetrate the north to south wall of high pressure along the spine of the North Atlantic despite being a weakling. One reason it will be able to move east is that a memory of “Na5” developed in the Baltic. Perhaps is is a secondary, and should be called “Na5son.” It will not be as strong as models foresaw, as half of its energy is going into the formation of “Na5three” down in the Black Sea. Nor will it be northeast of Finland as midels mforesaw, but rather will backtrack northwest right over Finland, Sweden, and wind up northwest of Norway, approaching the Pole from a new and interesting angle. Lars will not be able to stand up to attacks from both Canada and Scandinavia, and will depart to the south, into central Siberia. We will have switched from a Pole dominated by high pressure to a Pole dominated by low pressure with remarkable speed. The next storm, “Na7”, looks like it will come under Greenland and scoot north of Iceland and Scandinavia to join the party at the Pole, and the one following it, “Na8”, looks to be a true North Atlantic Autumnal Gale. However that is a week away, and it is hard to trust the models in such a chaotic situation. There seems to be a lot of Atlantic air flowing north with these systems. Because we are in transition, it is likely we are not seeing the winter pattern. Last winter Scandinavia had a lot of Atlantic Air flowing up from the southwest, but I would not use the current pattern as a sign they will see southwest winds this winter. Often the winter pattern is the opposite of the autumnal pattern, so perhaps this hints at east winds in January, and shuddering cold. Despite the temperatures being above normal on the Atlantic Side, they are below the freezing point of salt water in many places. No longer can above-normal temperatures bring much thaw, and ice is reforming. I expect we are at our minimum. We likely should save a map of this important moment in the political history of the United States. 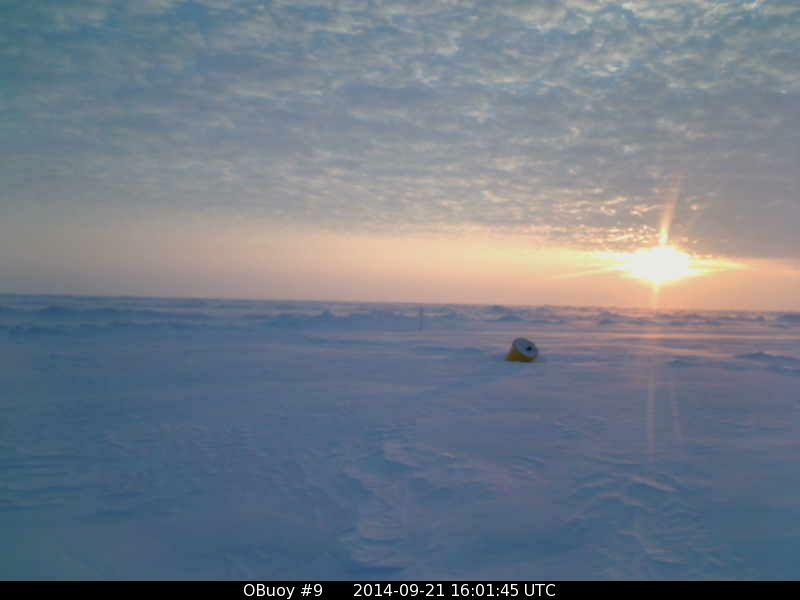 One thing I notice is that the ice is much more tightly packed this year, where it remains. After the equinox days grow shorter with increasing speed, the further north you travel. At our northern camera up near 86.5 latitude the darkness will descend in a matter of days, while our southern camera, which has been shoved north nearly to 78 degrees, the shortening daylight will last a little longer. It is likely these will be among our final pictures, for when the lenses frost over there is neither sunshine nor thaw to melt them clear. I missed last night’s map, and this morning we abruptly see Na6N passing over the Pole, with “Lars” sliding down into the Kara Sea as “Na5son” builds over Finland and proceeds the “wrong” way west-northwest towards the top of Norway. 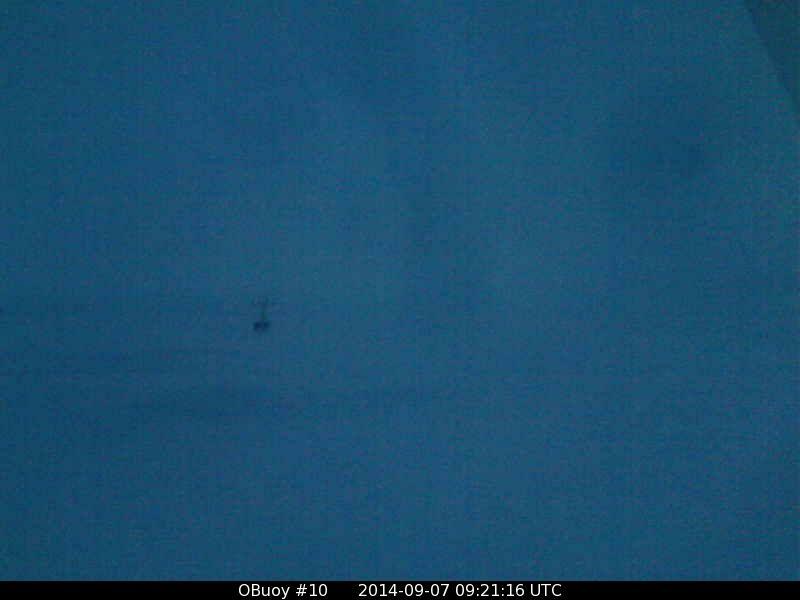 “Na7” is crashing into Greenland. Quite a pool of minus-ten air is forming over the Pacific side of the Pole, and I wouldn’t be surprised to see the minus-fifteen isotherm appear soon. “Na6N” is stronger as it wobbles away from the Pole towards Eurasia. The air in its wake is very cold on the Canadian side. It is slurping fuel from what must be a long occluded soda straw, shown by the spike of warm temperatures north of Svalbard, moving all the way to the Kara Sea and the spiking back towards the Pole. It’s a final straw, and I think it will collapse and the storm will starve and weaken. “Na7” split in two like “Na6” did, and the northern part is heading up Baffin Bay like “Na6N” did, but apparently models don’t see it having a chance when it runs into the very cold air north of Baffin Bay. (We’ll see about that.) Instead the southern part looks like it will become the first real North Atlantic Gale of the autumn, and Scandinavia will get quite a windy Friday, with air rushing up from the southwest, on the southeast side of the big gale. On the coast of Alaska and Canada weak lows drift east, which I am glad to see, as they prevent the export of that very cold air down into North America. I’m not ready for winter down in my neck of the woods. I’m glad we aren’t getting a gale here. 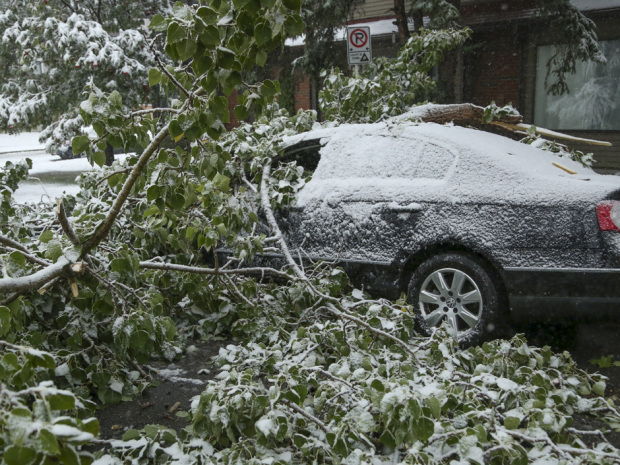 Strong winds tear all the turning foliage off the twigs. I like the autumn to linger. A QUICK GLANCE AT THE…..YOWZA! Take a look at the complexity of this map, and perhaps you can understand why I feel ready to throw in the towel. This is a map that would challenge even the most trained meteorologists like Joseph D’Aleo and Joe Bastardi. Me? I’m just a dreamer who likes looking at clouds. A map like this deserves attention. It requires research. It is like a big homework assignment, but I never have been all that good at homework. Ask my math teachers, if any are still alive. They will tell you I spent all my math classes looking out the window, at clouds. Somewhere, in places like Scotland and Sweden, young meteorologists are giving this map the attention it deserves. They may have names for all the warm fronts, “Haggis” and “Blorg.” They are the ones you should seek out, for keen and insightful observations. Me? 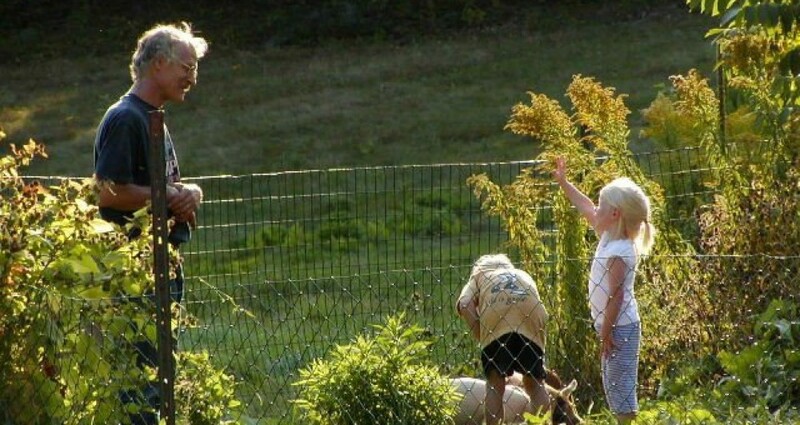 I’d rather observe other things. The autumn foliage is very beautiful in New Hampshire this year, and I’m observing differences in this year’s beauty from other years. That is the direction my semi-scientific mind is wandering towards. 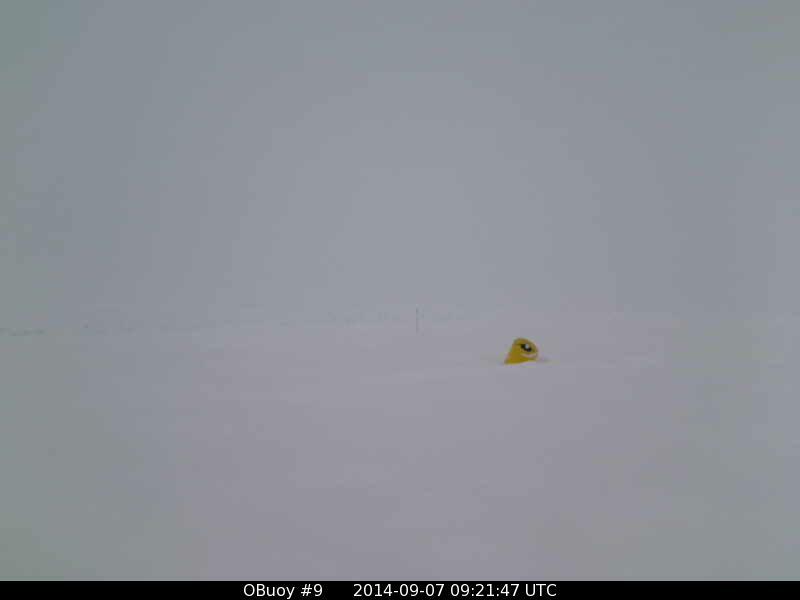 I have decided to conclude my focus on sea-ice with a conclusion, which will be my next post. 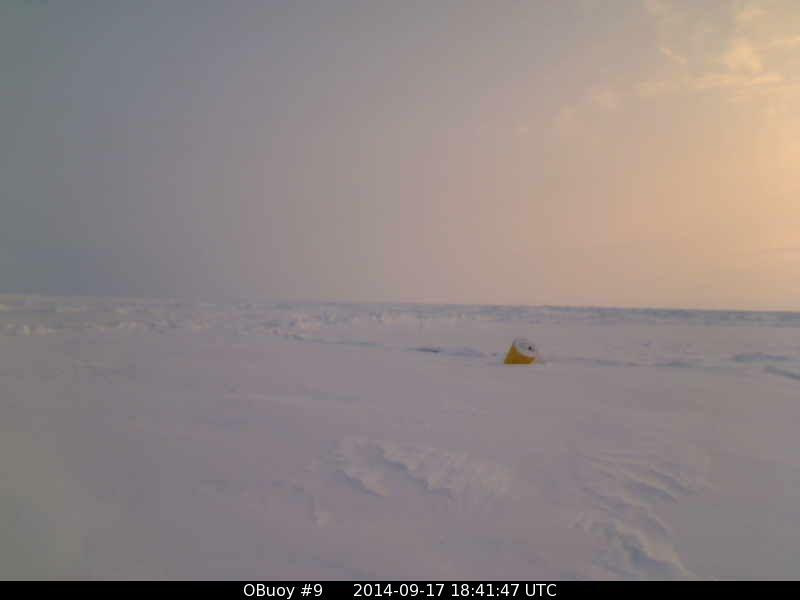 After that I will post every week or two about the regrowth of sea-ice. I will do that for my friends on the internet. However it will not be my focus. My focus will be fall foliage, and what follows. I also will try to keep an active post of DMI maps, with the most recent map at the top. But this is only because I think it pays to look at such maps, at least until the flow becomes zonal around the Pole. ( I think any meteorologist who looks down at the globe from the top, as well as at maps that view the globe from the side, will be a step ahead of his brethren this winter.) However I will not comment. It will not be my focus, unless it has something to do with foliage and what follows. I understand that the number of viewers of this website may drop. More people are interested in sea-ice than foliage. However I am not as interested in sea-ice as I used to be, especially as the cameras will soon shut down and I won’t be able to see any beautiful arctic views. Part of the reason I am losing interest is because I feel the people interested in the Truth about Global Warming are already educated. I was disgusted by the recent march in New York City of people who feel “Global Warming” is an issue worthy of demonstrations. 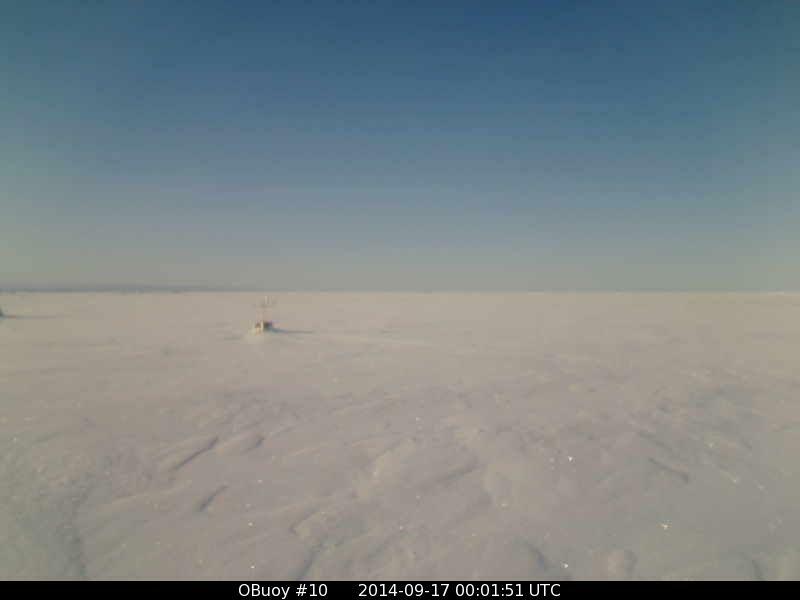 They have arrived at their decision without ever bothering to look through the eyes of the North Pole Camera. Truth and facts don’t matter, as what they believe, and call “education,” is sheer dogma. Therefore it is useless to present the facts my lying eyes have learned, at this obscure website. They feel they are already educated, and have nothing left to learn. In order to penetrate the thickness of their Neanderthal thinking I must discover a different approach. This blog will move in that direction, whatever that direction is. How does one argue with dogma? I am fairly certain it doesn’t involve facts, charts and maps. I think the only penetration must involve poetry. To a scientist this may seem like touchy-feelly crap, and in some ways it is, but in other ways what motivates the mortal psyche is: Deep-down and gut-level moods. Next time you watch a movie, pay attention to the background music. Ask yourself, “How scientific is that?” However it makes a big difference. For example, imagine a girl walking under a starry sky, and two different sorts of background music. The first is serene, and the second is ominous, with an increasing drum like a beating heart. Which movie is the love story, and which is the monster movie? In terms of the Climate Wars, it has been a battle for the hearts and minds of people. The battle of the minds is over, and science has proven Global Warming is a farce, a fraud, and fake and phony and funded by political bribery. Now the battle is for hearts. And that strange world is where this blog is now adventuring off into. Pragmatic people may want to gag, and therefore I will try to differentiate between the posts that are sensible studies of sea-ice, and the posts that involve functioning midst the hysteria of a crazed society. Quite a storm for Scandinavia. Yikes! Temperatures dipping to minus twenty, in the blue twilight of the growing arctic night. Some of this cold air will be sucked south and east by the big gale off Norway. Likely a cold blast is coming down onto Svalbard. 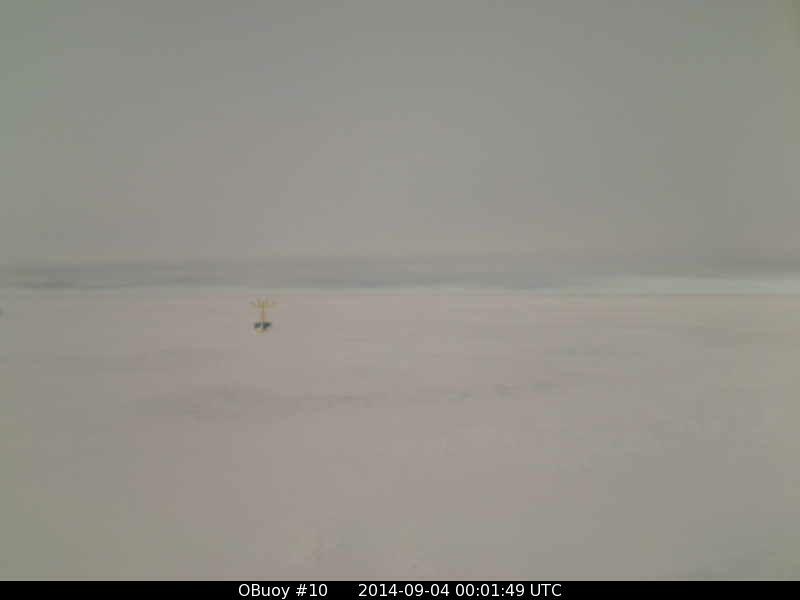 We lost both Buoy 2014B to our west on September 11, and Buoy 2014C: to our south on September 22, as the warm Pacific water from the “warm” PDO continues to erode ice even though the air temperatures have been persistantly below the freezing point of salt water. The same thing happened last year.